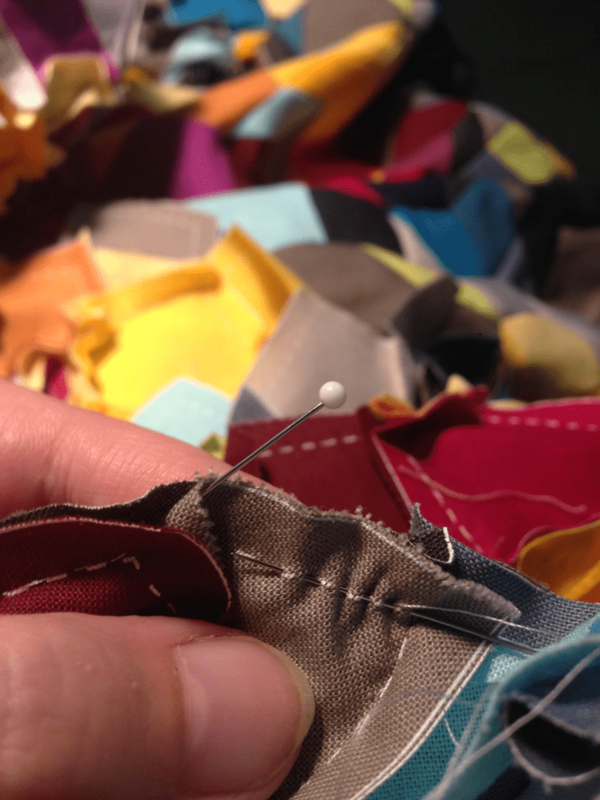 Quilting is made up of so many steps… by the time you get to the actual quilting stage of the game you realize there is a whole new layer of design to contemplate. 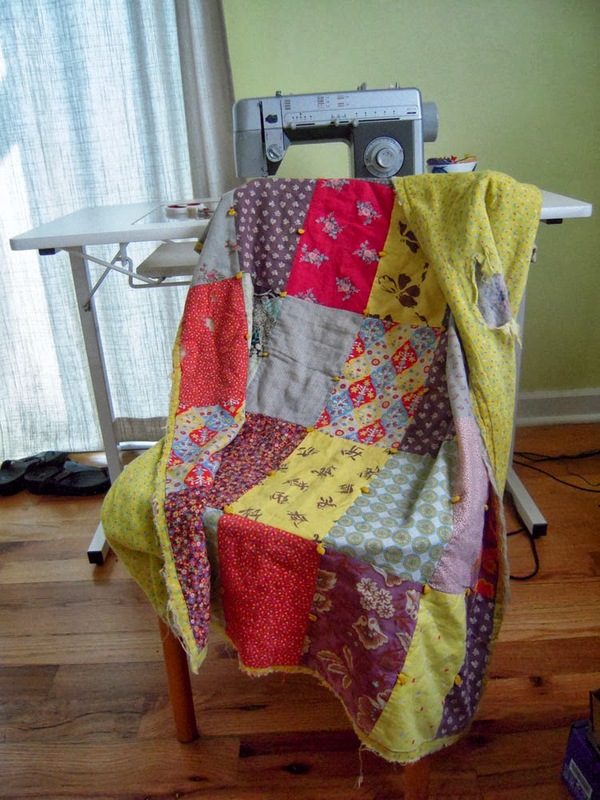 I think I’m going to ‘stitch in the ditch’ and after I go over all the seams, I’ll see if, and where, I would want to quilt more. 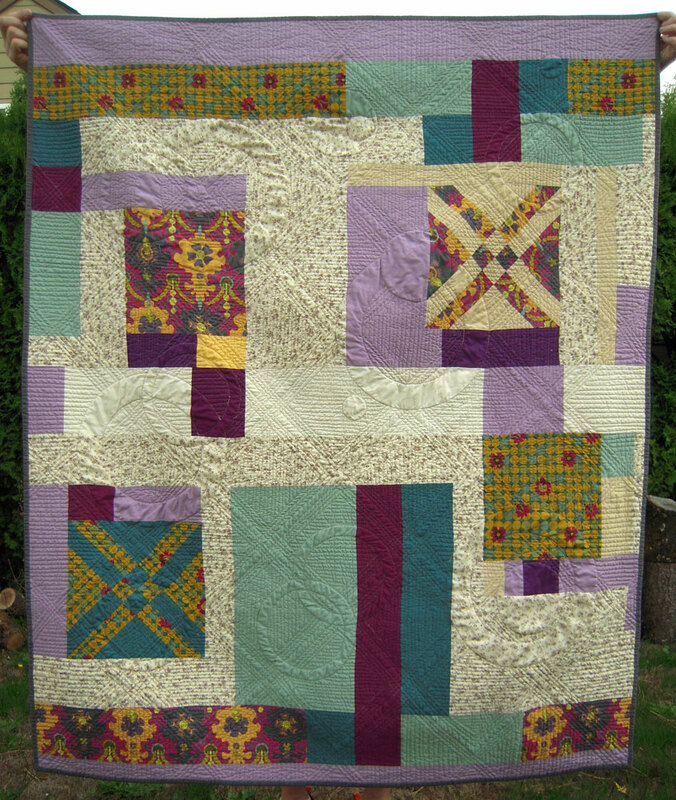 The quilting of this piece can be simple to offset the busyness of the patchwork. 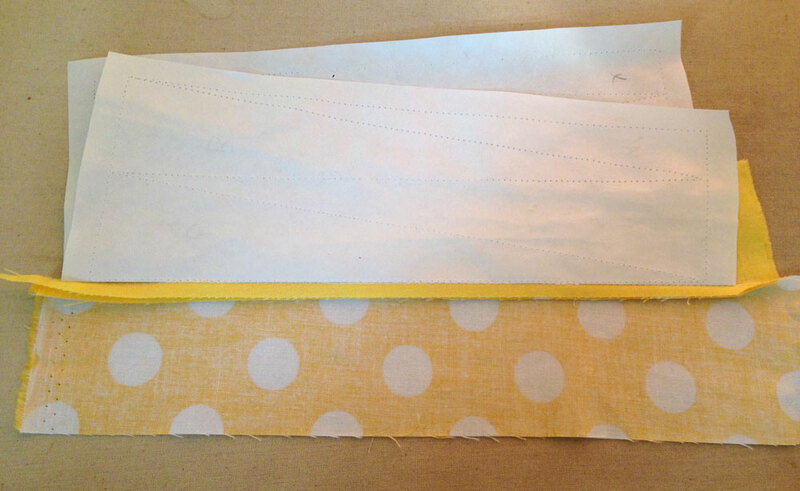 For this quilt, I used a plain muslin backing and wool batting – it’s already feeling quite yummy! Wool batting works really well for spray basting because it holds it’s shape better than a cotton batting. 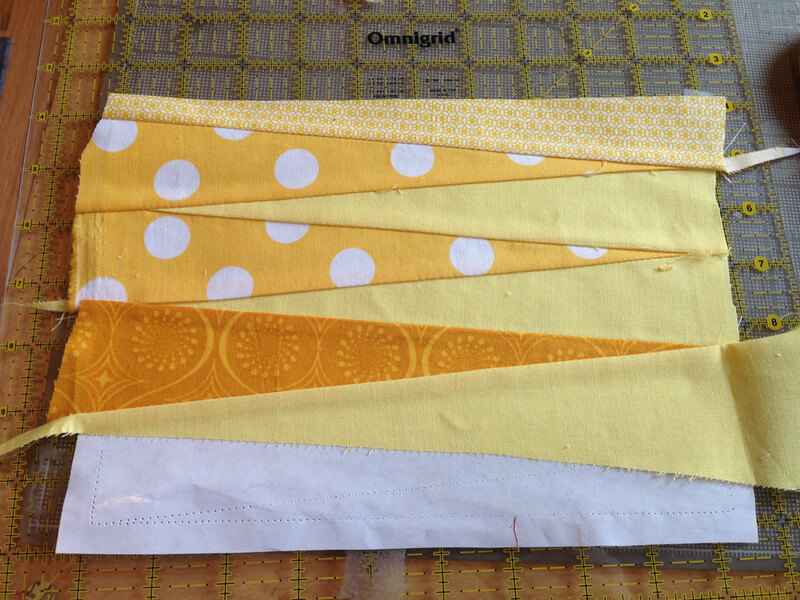 Look how awesome it looks already… and I haven’t even quilted it yet!! I’m loving everything about this – especially the process of making it. Because this quilt is based on the Third Chakra or Manipura, I’m focusing on my personal self-worth while creating this physical piece. I’ve actually kept track of every minute I’ve spent. 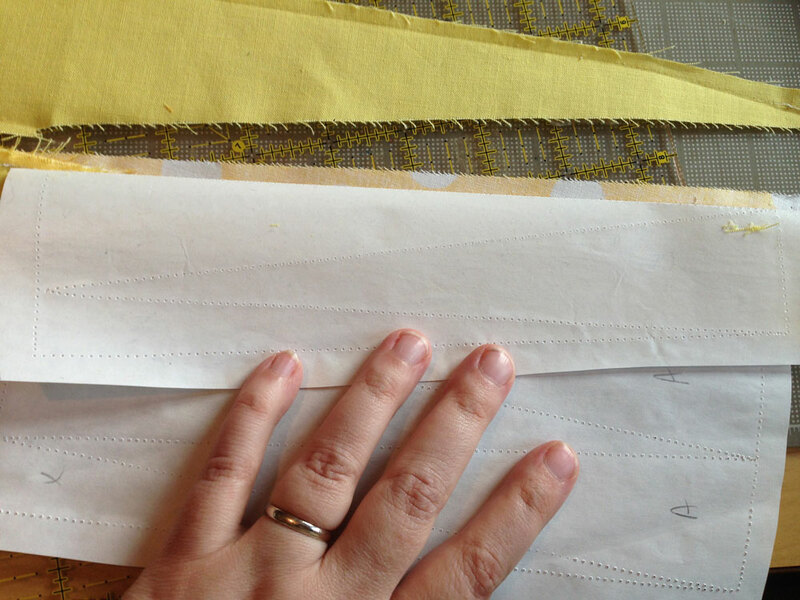 So far, I’m over 70 hours into this project – cutting and sewing time only. Design, layout, fabric and decision making ponderings are not included in this time. 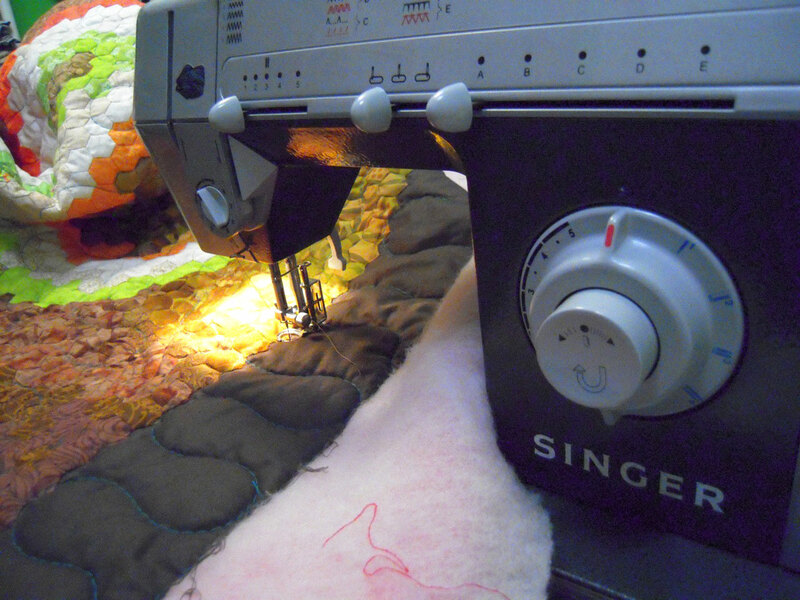 I still have quite a few hours to put in for quilting and binding. 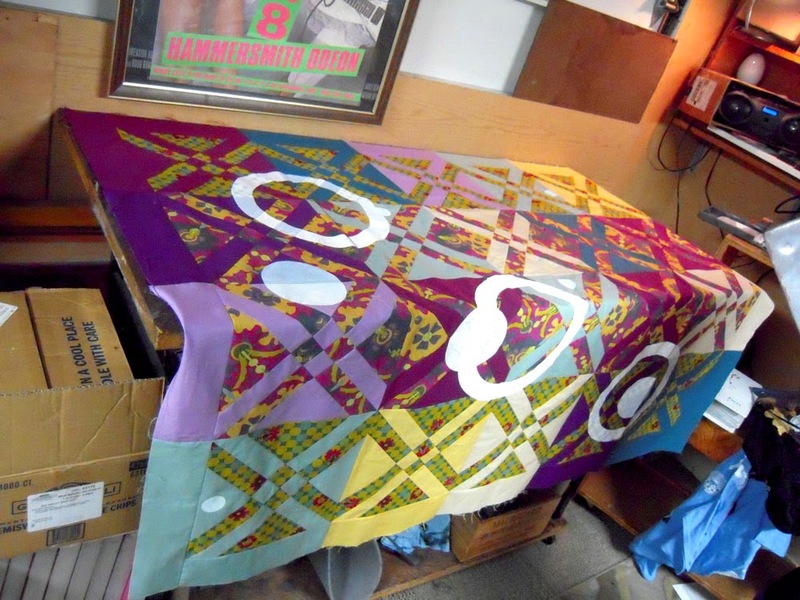 At a wage of $20/hr, I’m making an “over-priced quilt” by the standards of today’s marketplace. However it’s priceless to me, due to how helps me emotionally. I found out the other day that I have some nerve damage in my mouth, and it causes pain that can’t really be fixed. I noticed it gets worse with inflammation, so now with PMS, I get dental pain – so fun. There are also a bunch of failing crowns and inlays that are only a few years old that will need to be replaced. I’m trying to cut down on stress, and having to go to the dentist isn’t helping. 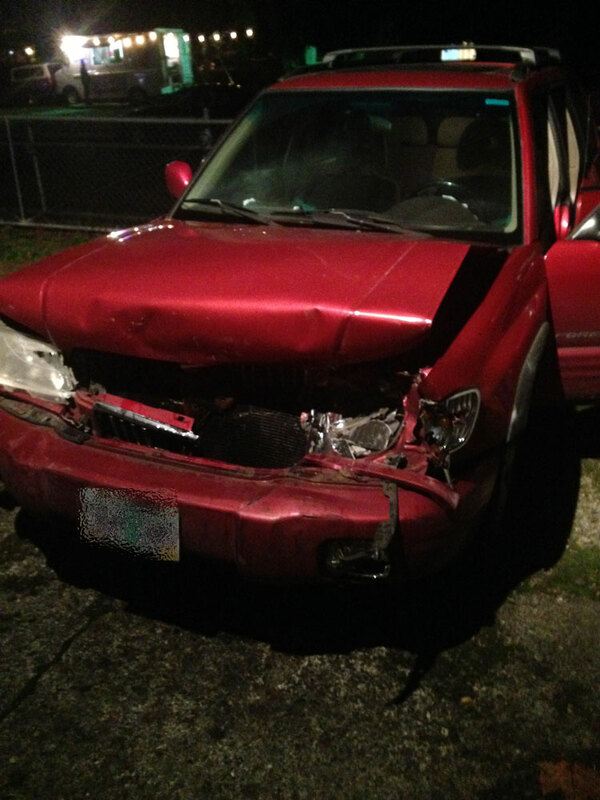 To top things off- we wrecked our car the other night. This is what happens when someone randomly stops in the flow of traffic. Luckily no one was hurt, and we were able to drive it home (only a few blocks away). The bummer part of it all is that this was our only car… and I would be surprised if it’s not a total – the airbags even went off. So instead of quilting, I’ve been on the phone with insurance agents, and looking at cars for sale. I’m hoping to find an inexpensive, good running car – I don’t think we’re able to swing a monthly car payment. I have to keep reminding myself that good often comes from change. This photo was taken around midnight (I practice late) so it’s a bit dark. When the sun is out, this room is bright and wonderful. 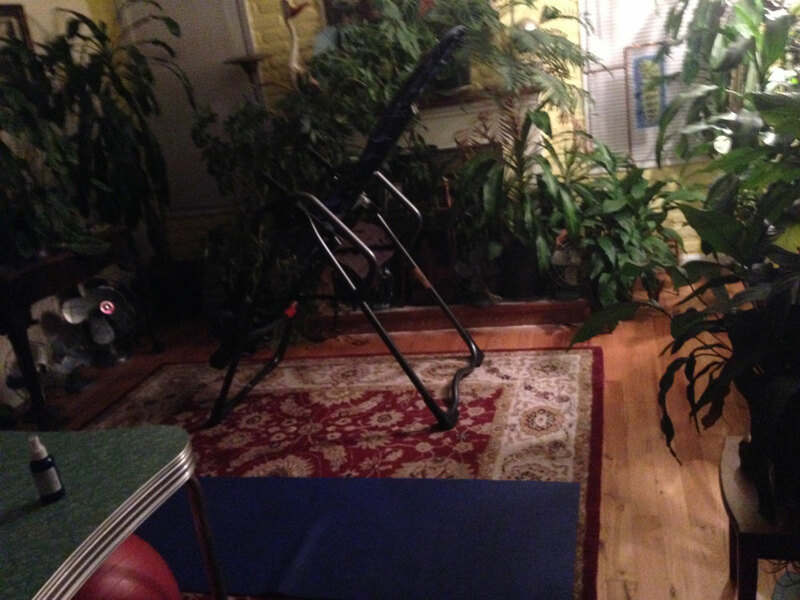 I’m lucky we don’t have living room furniture yet…it leaves plenty of room for movement. You can see how calming this space is. There is no video in this room either – just plants. It’s simple and awesome at the same time! What are you doing to stay sane this week? 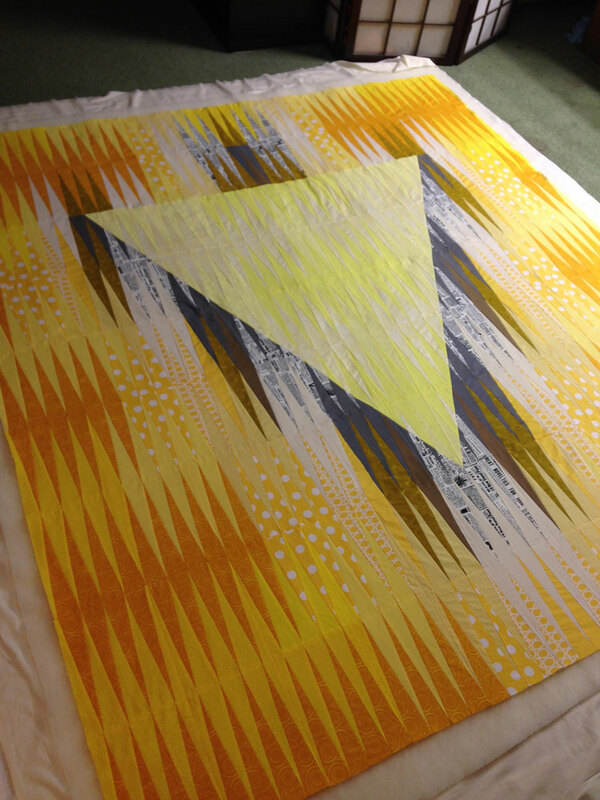 A Screen Printed Quilt FINISH! Super happy with this one! I made the blocks based on “Anita’s Arrowheads” technique by Anita Grossman. 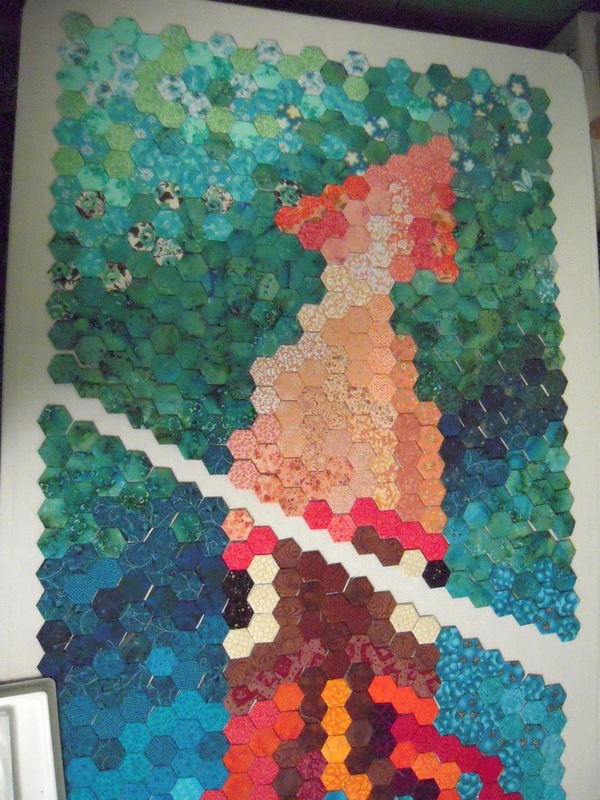 You cut all your pieces for one block with just a few rotary cuts. It’s a really fun technique – try it out sometime, it makes for nice clean looking blocks with pretty accurate points. The top sat while I worked on the back. The back actually took way longer to make than the front, but I did use up all my scraps from the front! 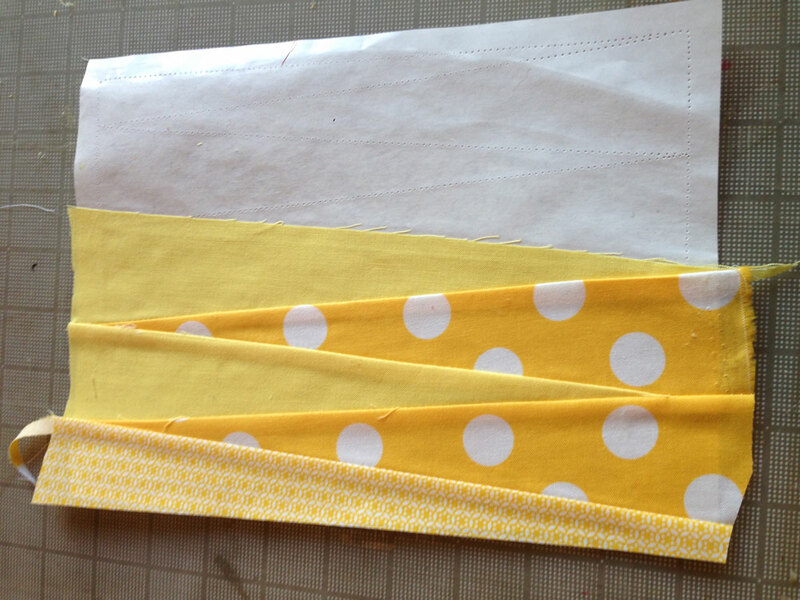 I even used an older creamy/brown calico-ish type of print to punch up the more modern fabrics. I kind of like the back better than the front… but that’s just me. 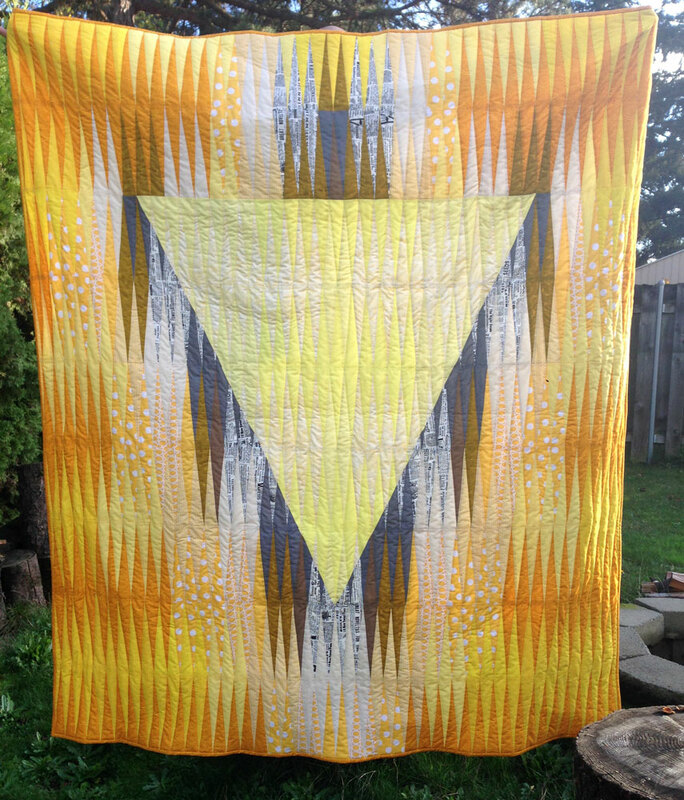 I worked with my husband on this quilt as a collaboration. He is a screen printer, and he did the decision making as to what to print and where. 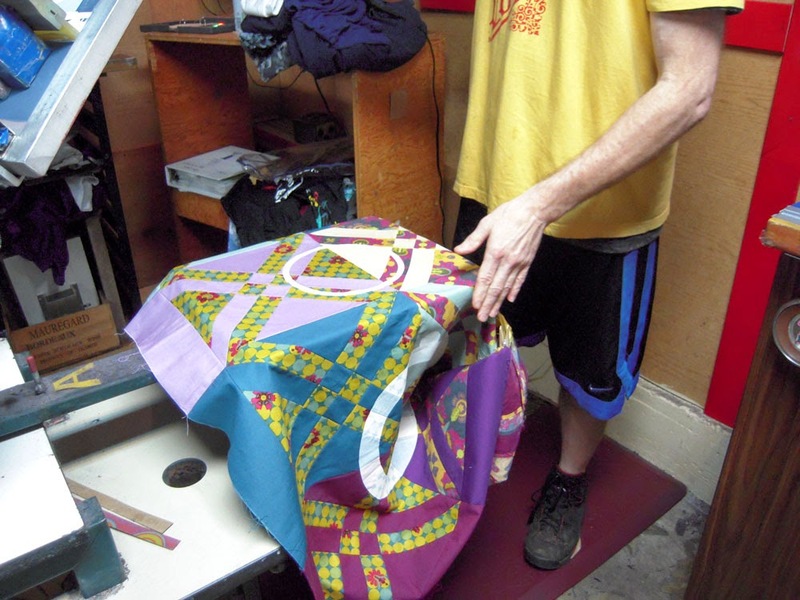 He used discharge ink which releases the dye of the fabric rather than laying a layer of ink over the fabric. 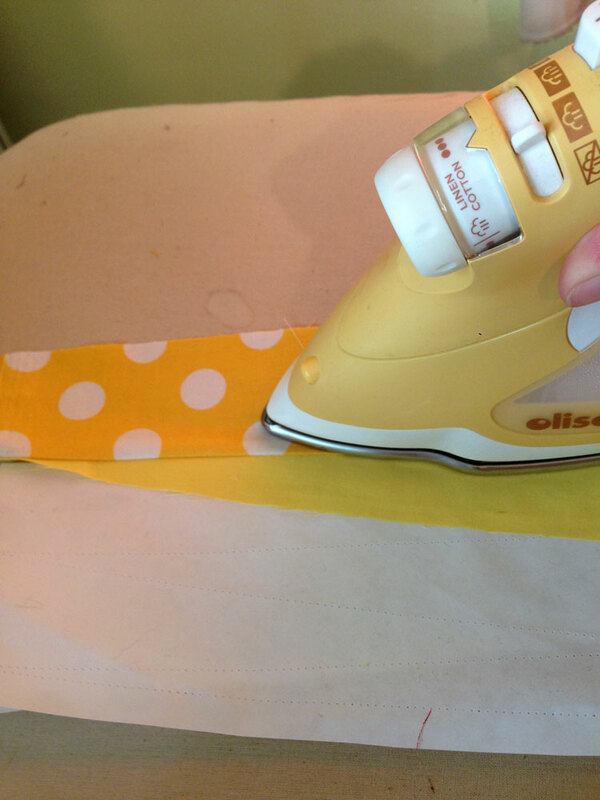 This means that after it’s washed, the printed area is just as soft as the rest of the fabric – and you can iron over it! “big ring” film. The black of the film is opaque and can block light. 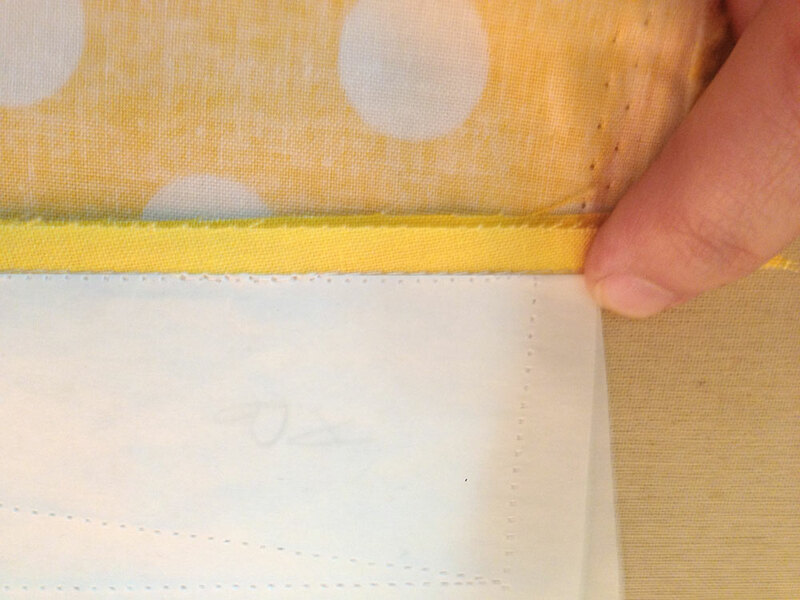 Printing over seams can get messy, and there are a few spots in the printing that are not perfect, but all in all, it came out beautifully! It sat for another long bit while I was saving up for my new Juki 2010Q. 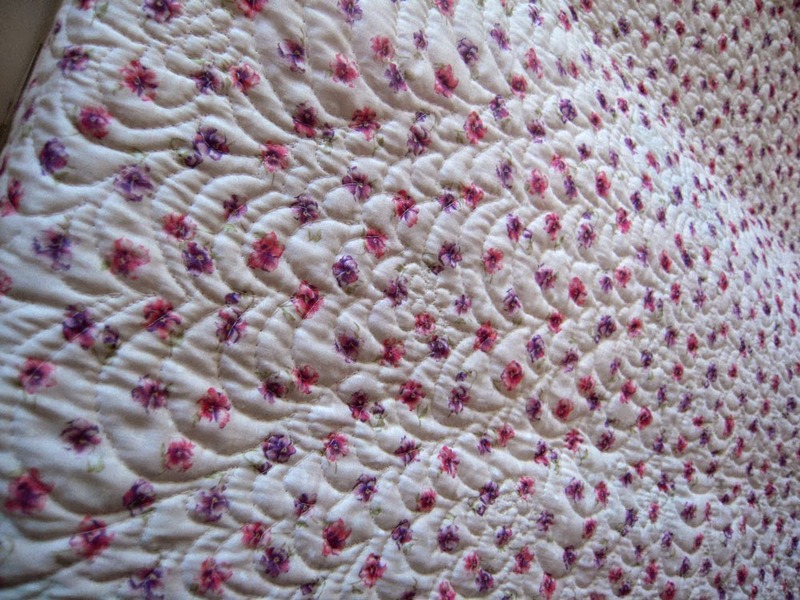 Now it’s the first quilt I’ve quilted on my new machine! It worked so well! 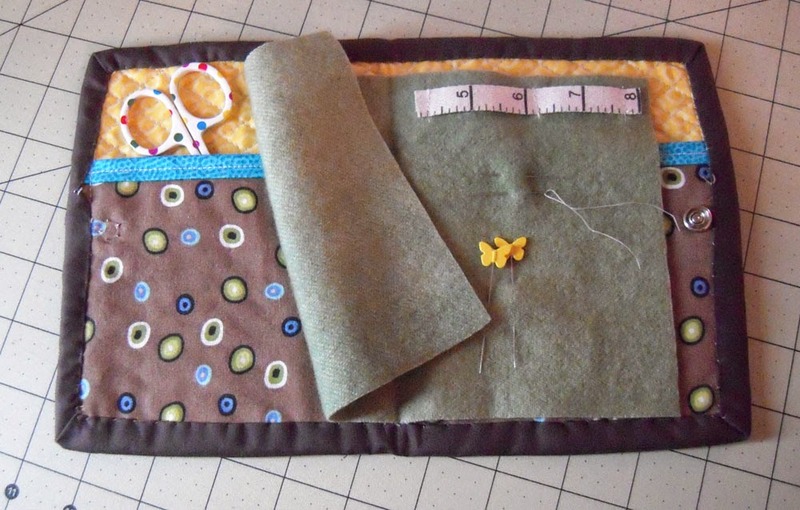 I used a walking foot for some parts, then switched to free-motion-quilting for all the fills. 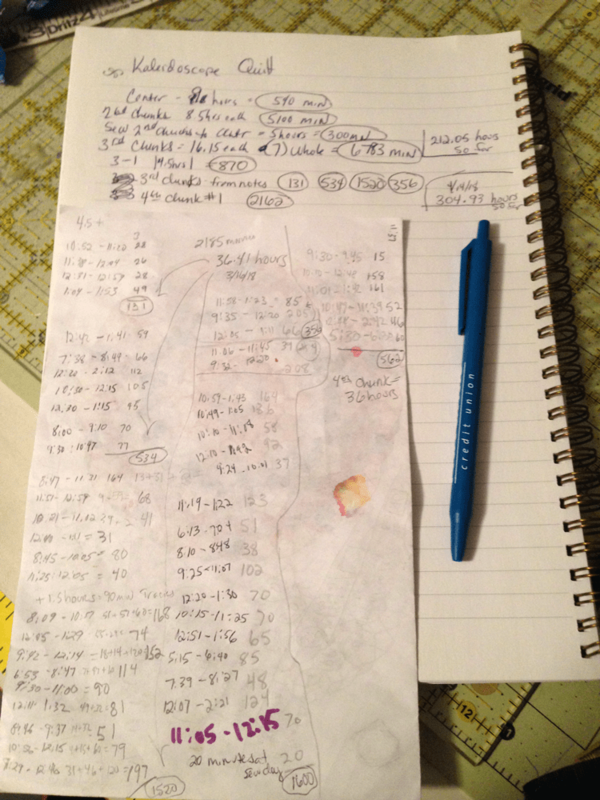 I ‘eyeballed’ all the lines – I don’t like taking time to mark up the quilt, and I don’t really care about perfection. As long as it is sewn well and will hold up in the wash, I’m good. After it was all quilted I had a big decision to make as to what to used for binding… but I found this darker grey Peppered Cotton that I think works so well. 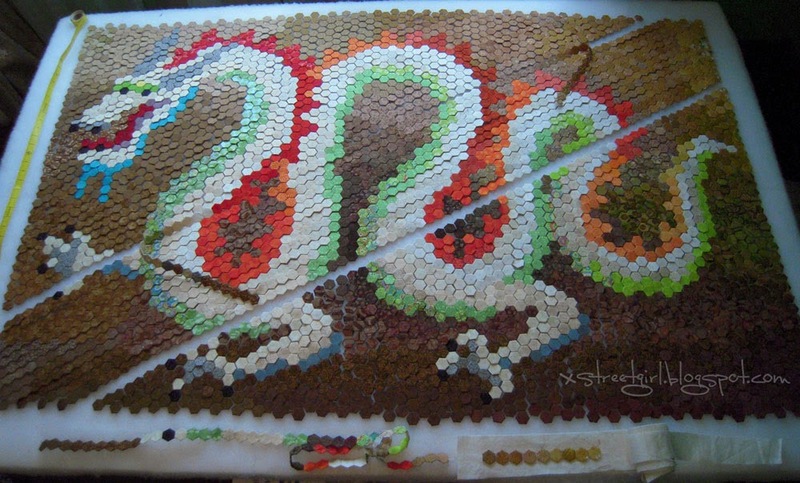 It ties all the other colors together – so fun! Now that it’s finished, I can bring it to show and tell at PMQG tonight! Hope to see you there! As some of you know, my husband and I have a small business printing custom t-shirts for local groups and businesses called Phantom Chicken. 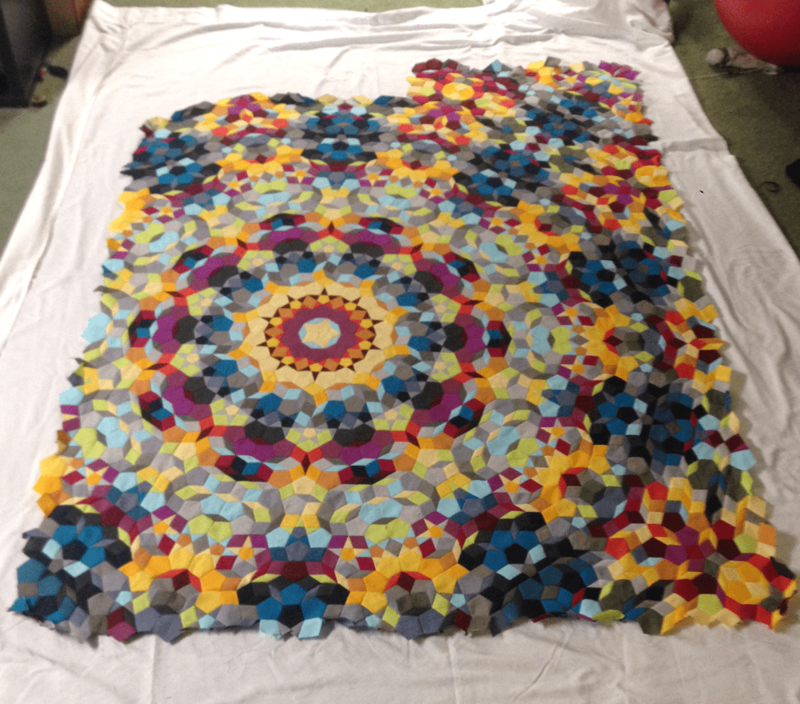 What you might not know is that we have been trying to mix this and quilting into one piece of work… and we are getting close to a finish! 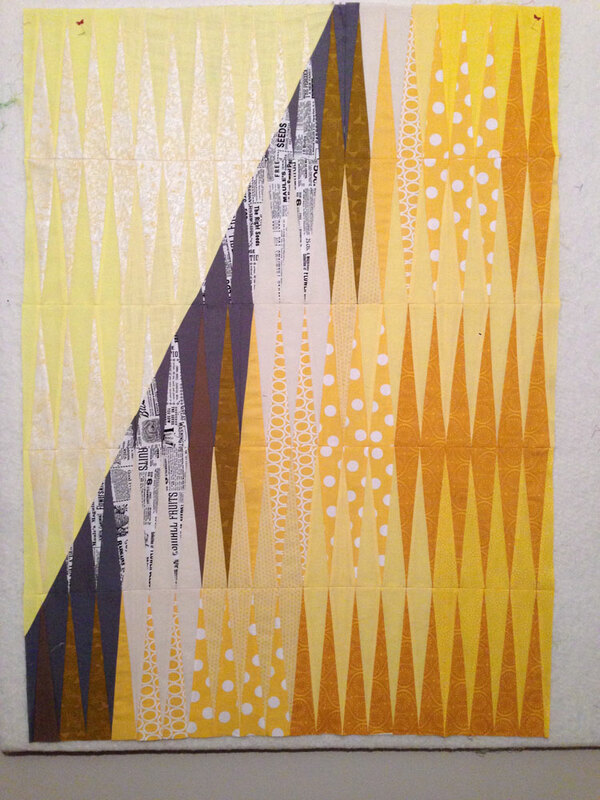 I made a quilt top last summer and I had planned an elaborate print for it. Because my first plan was so daunting, it just never came to fruition… so we altered the idea a bit. Instead of one big image that would need to be broken down into many interlocking parts, we made a couple images to print randomly over the top. 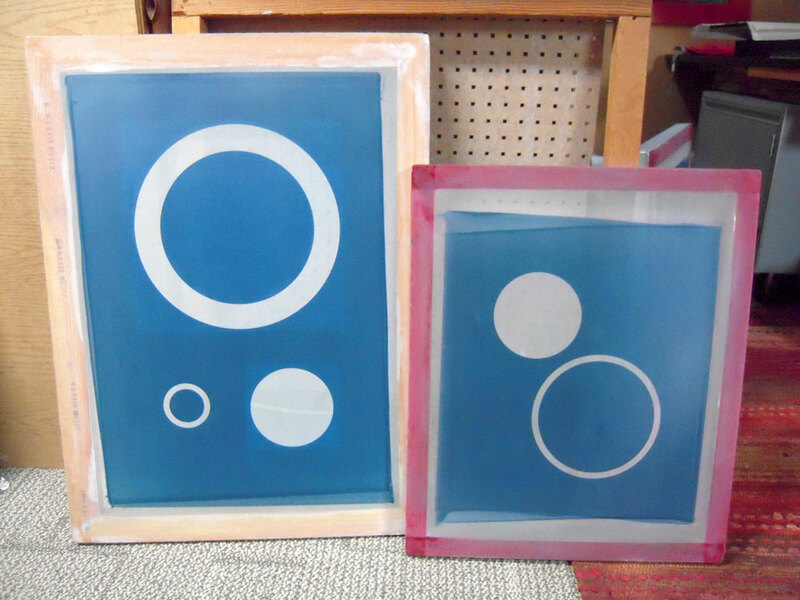 Since screen printing is a bit elusive to some, I thought I would share our process for printing here. 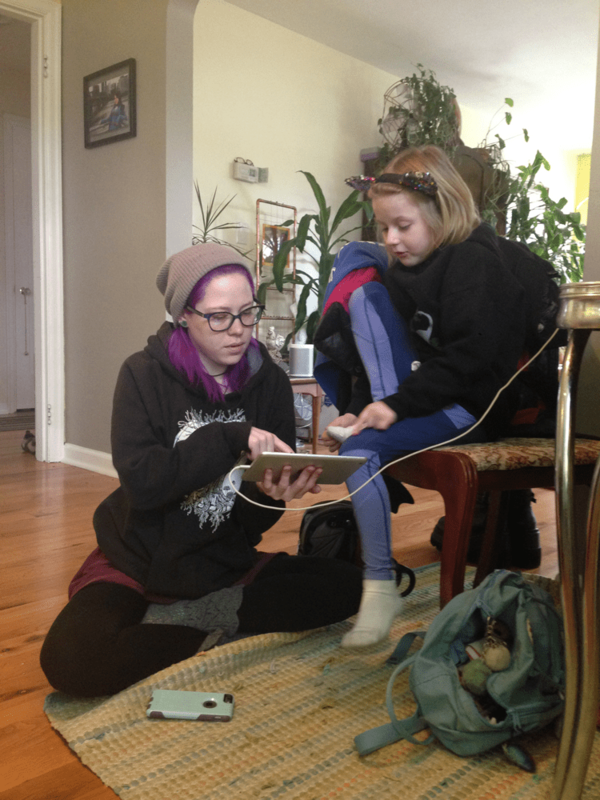 In time I would love to set up a workshop so people could try this hands-on… maybe someday! 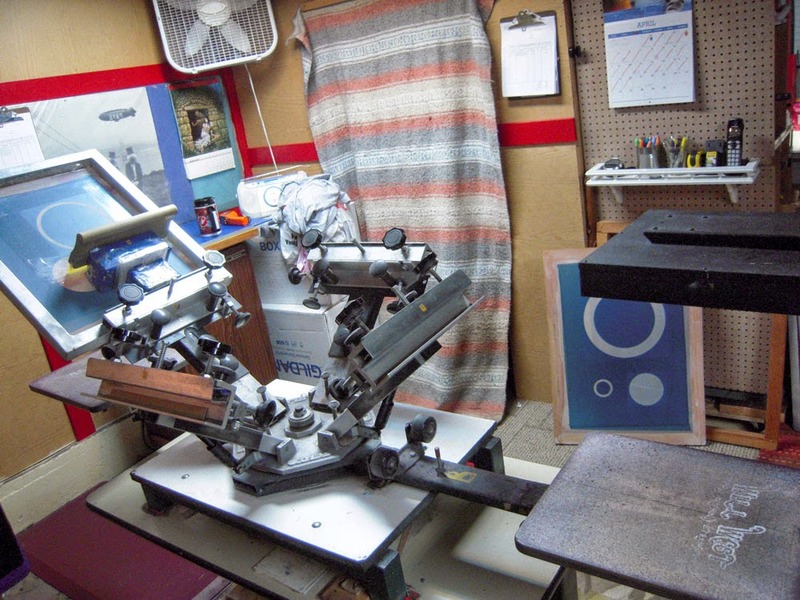 Even though screen printing has been done for thousands of years, and technology is pushing things to the digital world, you can still screen print old-school – by hand, which hasn’t changed much since it’s inception. For this project, we used a special ink called Plasticharge – it’s a two-part system that is heat activated and instead of laying ink over the fabric, it actually releases the dye of the fabric, leaving the feel of the print as soft as the rest of the unprinted fabric. 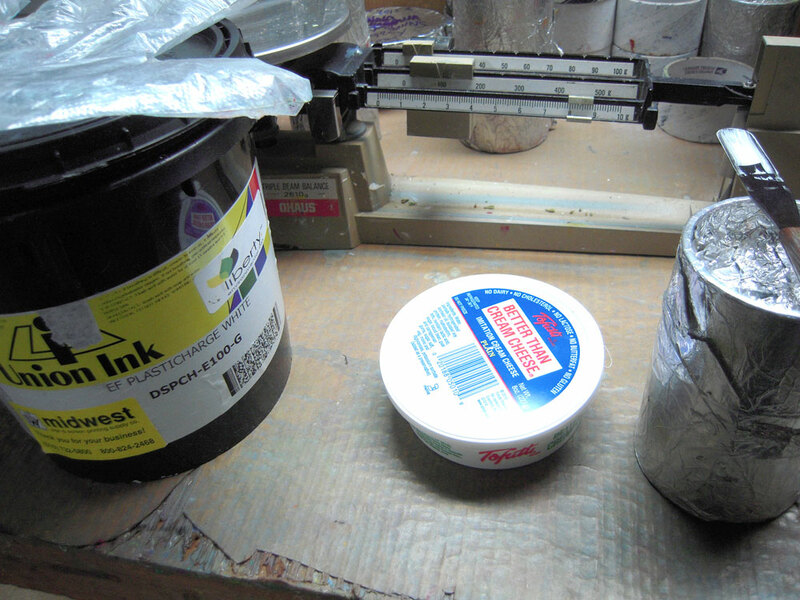 The ink comes in 2 parts that need to be mixed about 45 minutes before printing. Mixing needs to be precise. We used an old cream cheese container to mix in since we did not need much for this project. Besides the ink, we also need screens! To get a screen made, we first start with a design from the computer and send it to a camera-house that creates “film positives” for us. It’s just like a negative, only the parts you want to see (or print) are black and the rest stays clear. 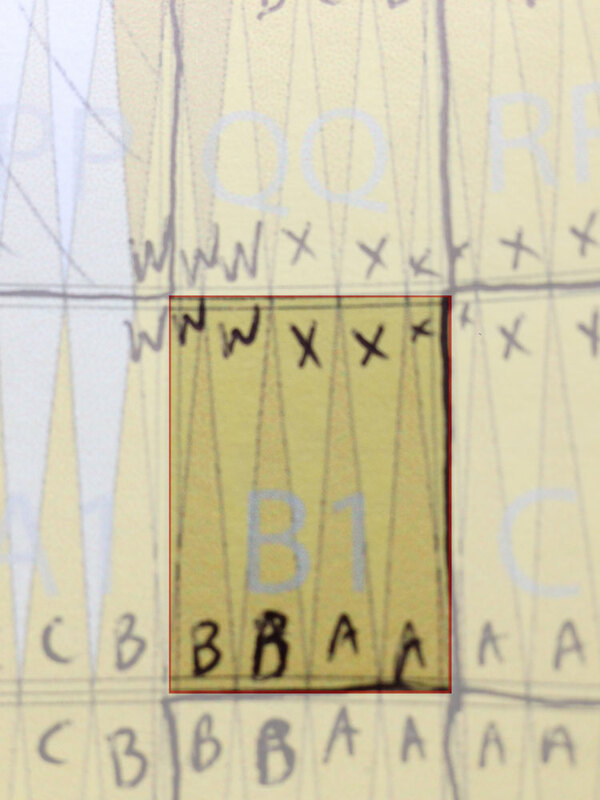 Above is the film for a large ring – what we want to print is black and opaque, and the rest is clear. We put this film on a screen covered in photosensitive emulsion and shine a light on it (shoot it) for about 15 minutes. The light hardens everything except what is under the opaque part. Water is then used to wash out the soft emulsion leaving a “hole” in the screen. Once the screens are made, they can be set up on press. Luckily for this project, registration was not needed since everything is one-color and printing randomly… otherwise registration can be the longest part of setting up. 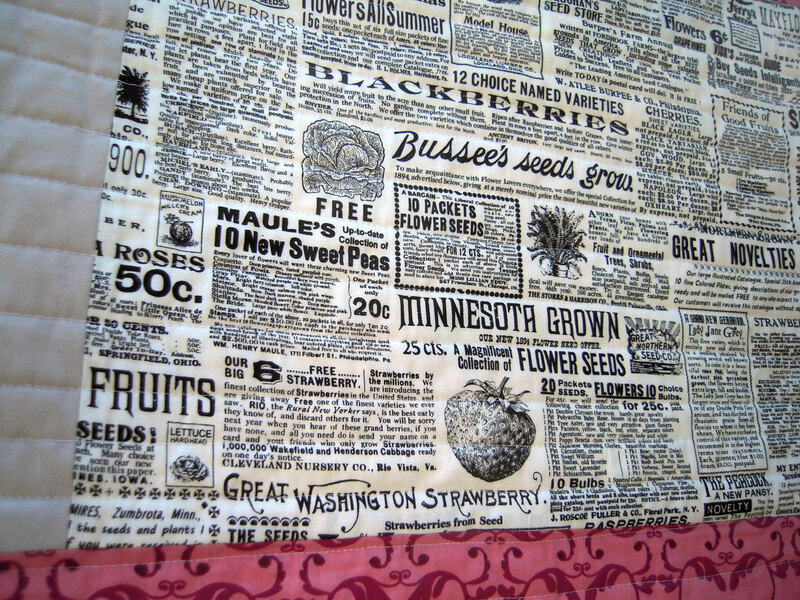 print on quilt! 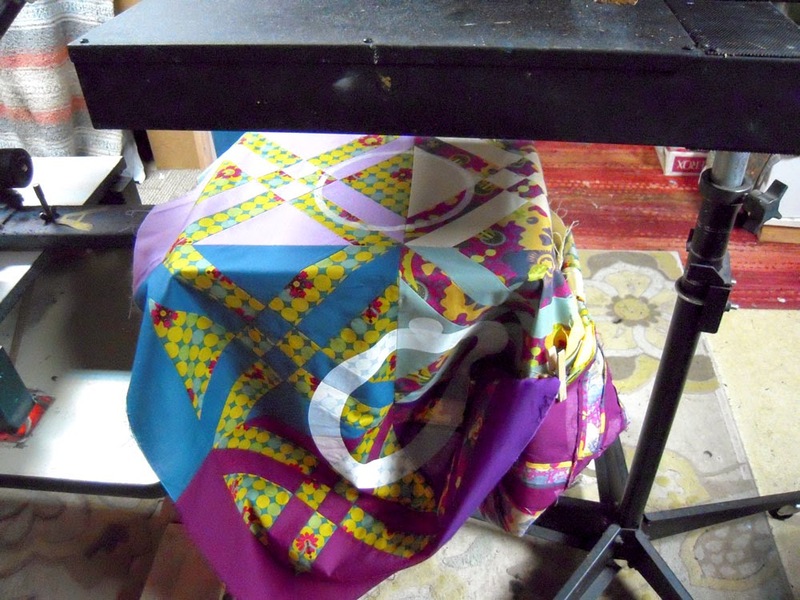 After this, the print needs time under a heating unit to “set” the ink into the fabric. Now this one part of the print is complete – but Gregg had many circles and dots to use and each print was done individually, so this took two afternoons to finish. This top will need to be washed before quilting. The ink leaves a bit of a residue until washed, so today I am stitching around the sides to prevent fraying in the wash. I’m hoping to have this one finished for the next PMQG meeting. 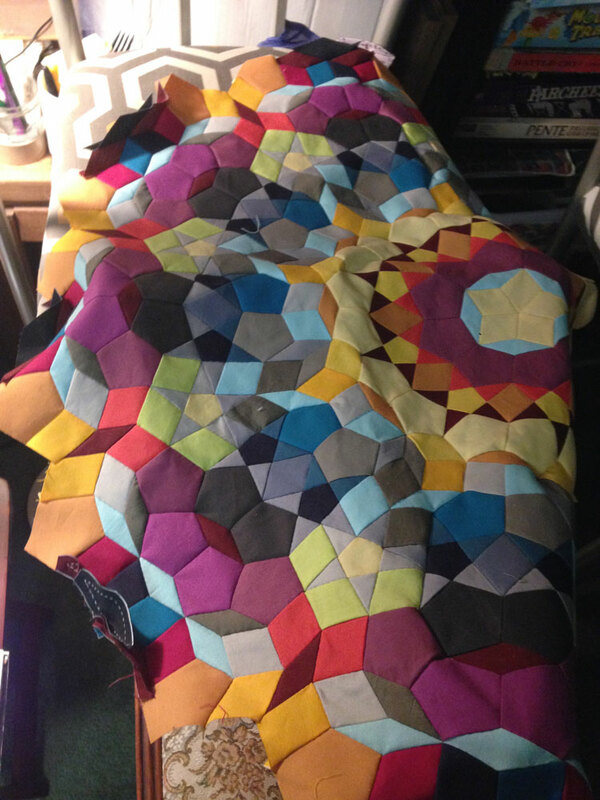 Time to think about ‘how to quilt this’… YAY! 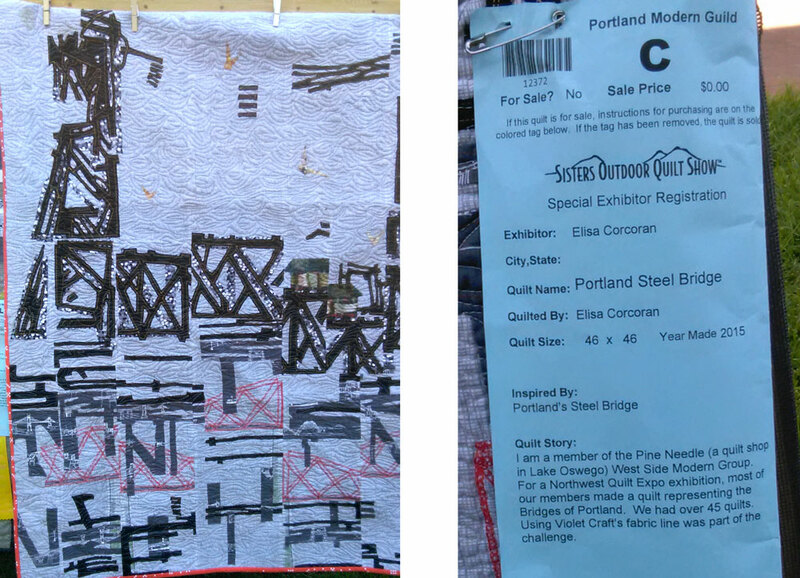 I love my guild… The Portland Modern Quilt Guild – what an amazing group of people. Our holiday party was a blast, and now I can finally share what I made for our gift swap! 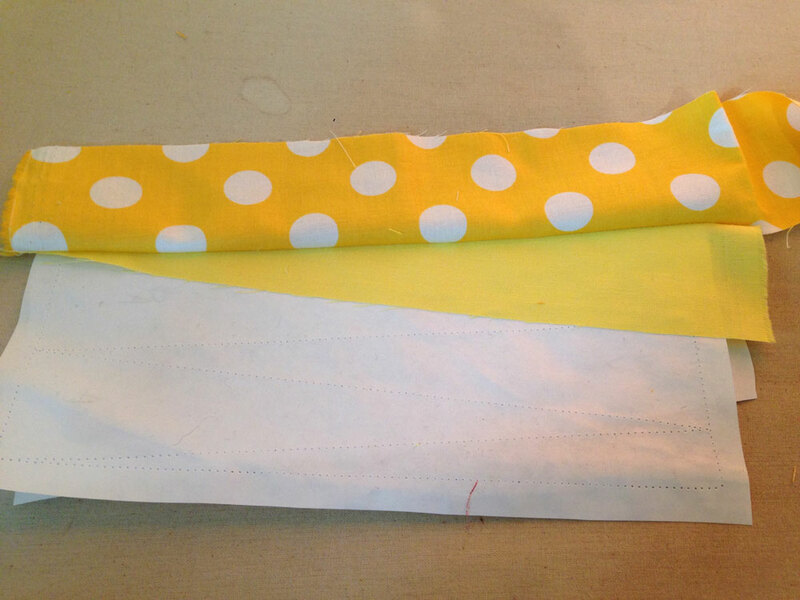 The swap was fun, we each brought in a sandwich baggie full of fabric to our Nov. meeting where we randomly received a bag of fabric from someone else. 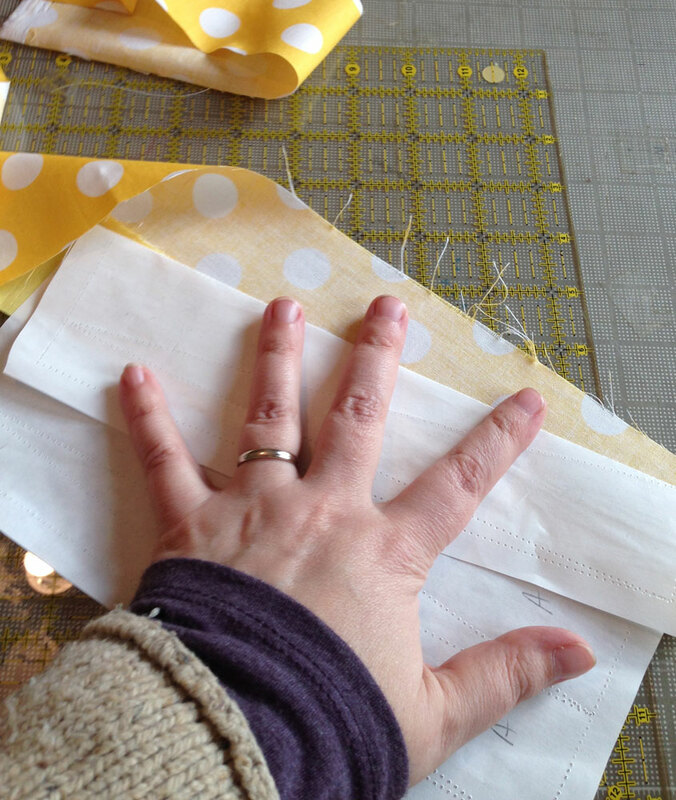 We used the fabrics in the baggie to make something for them from their own stash and brought it to our Dec. meeting. 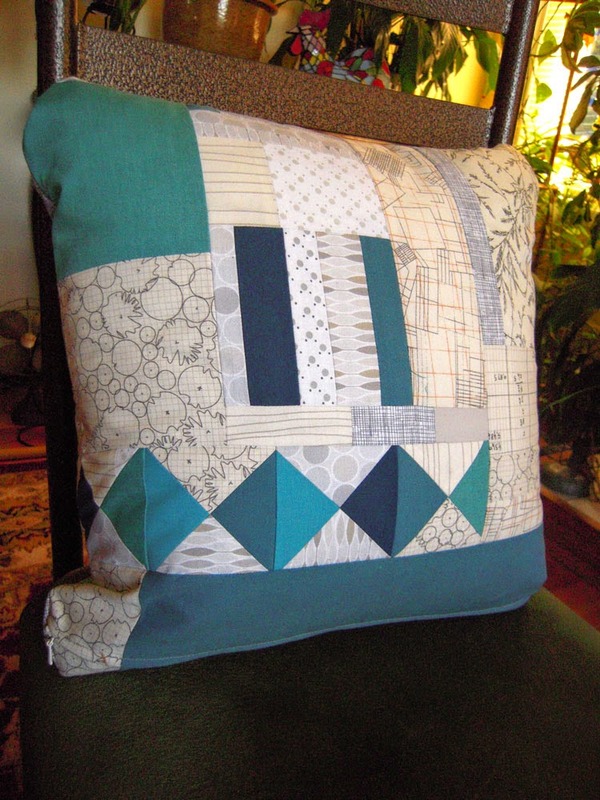 I received fabrics from Katie Blakesley of SwimBikeQuilt.com and I had never met her before… I was a bit nervous to make something for someone so prolific, but she liked the pillow I made for her, and that made my day! 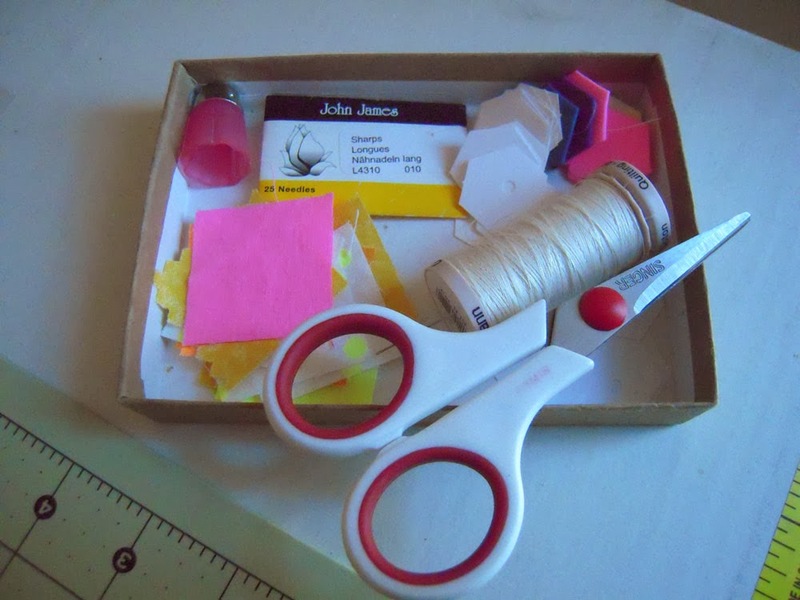 I received a great little needle-book from Pamela Barber – it’s a ‘book’ made of fabric with felt ‘pages’ so I have a neat little place to keep my needles and scissors for hand sewing. 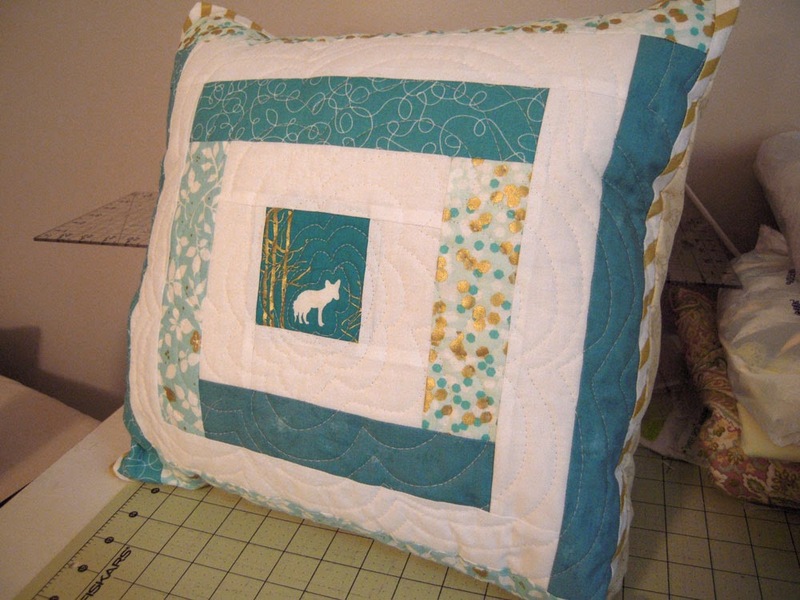 It’s so sweet, and the quilting on it is fantastic! The board members this year really did an amazing job at wrangling the 230+ members of our guild to keep things happily rolling along! Thanks to Mary Ann, Kelly, Suzanne, Lisa, and Cath – they all really excelled at making it a fun year with lots of things to do, and I, for one, am appreciative of all the work that they put into it. 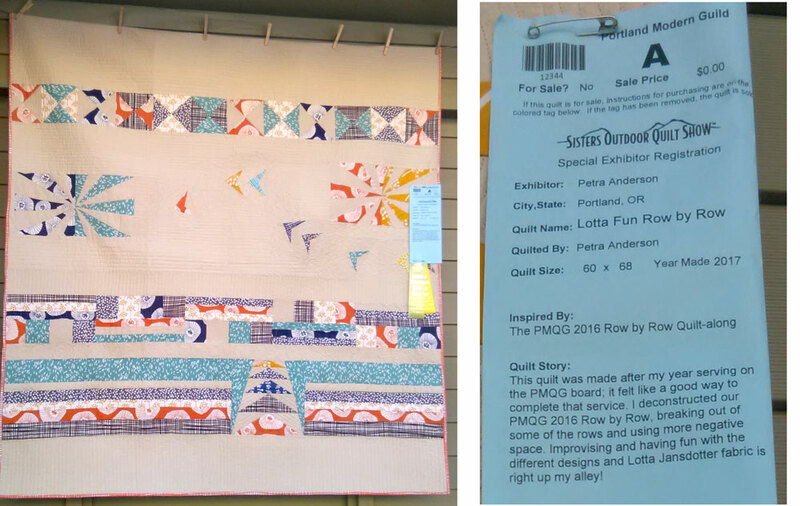 One event PMQG hosts is a monthly charity sew organized by Cath Hall of Wombat Quilts. 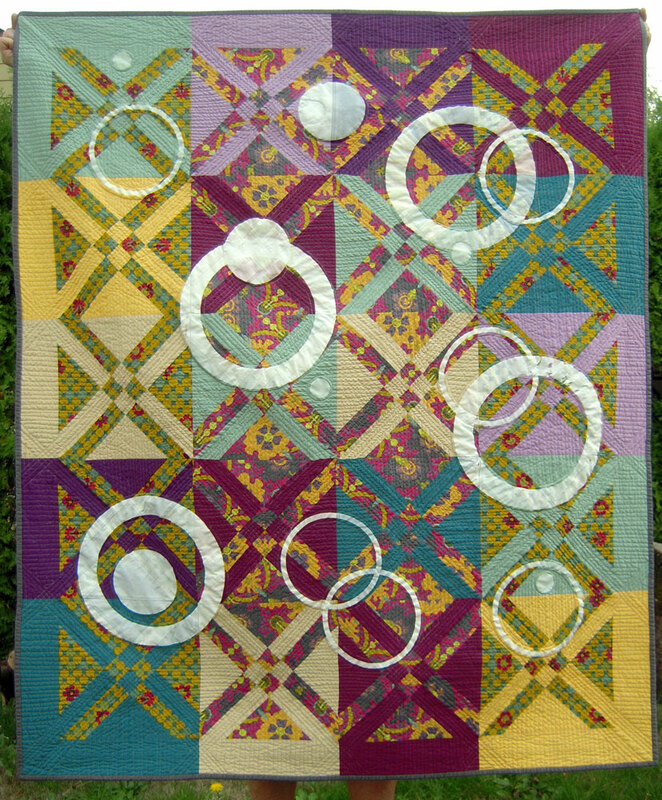 Each time a group meets, there is a simple block pattern to make using a bunch of scrap fabrics donated by individual members of the guild. 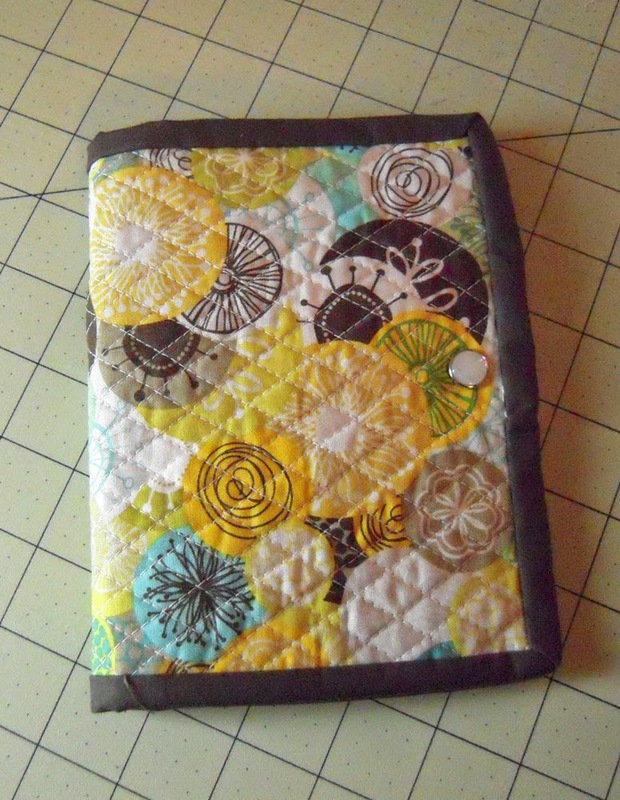 This time we made a scrappy 7.5″ block with 2″ white borders. 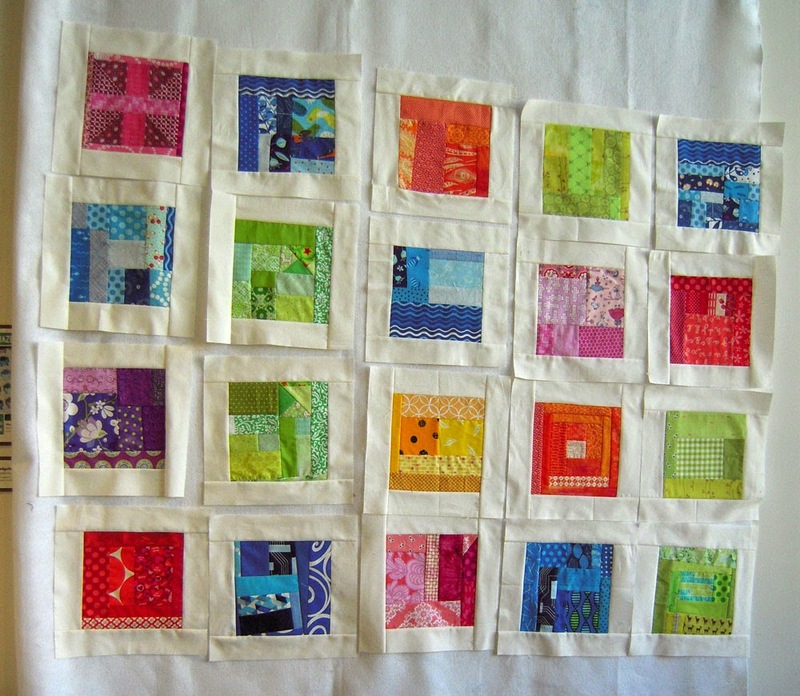 There were about 10 of us there and we made enough of these blocks for another quilt top for Project Linus. 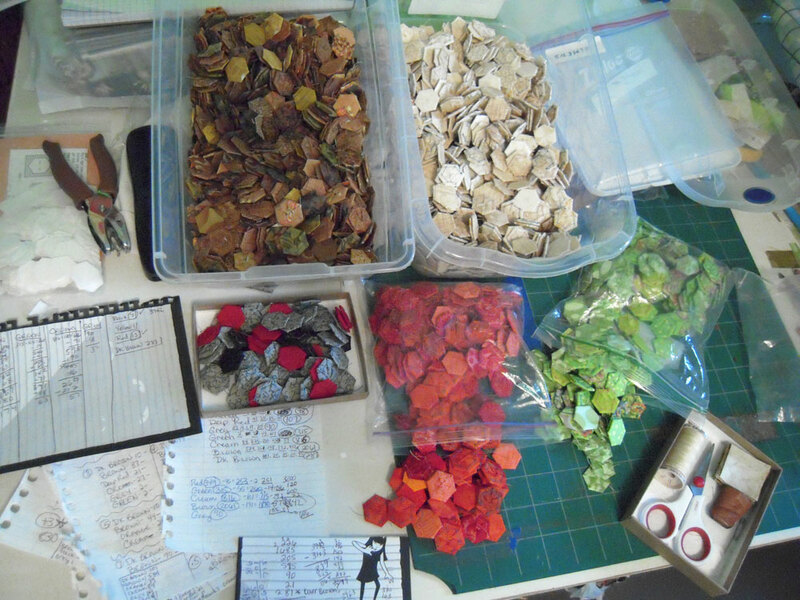 Scrap Station… so fun to dig! This is such a fun way to get involved and meet people from our guild, I really enjoyed this – there is nothing like working with a group of people all focused on the same project. 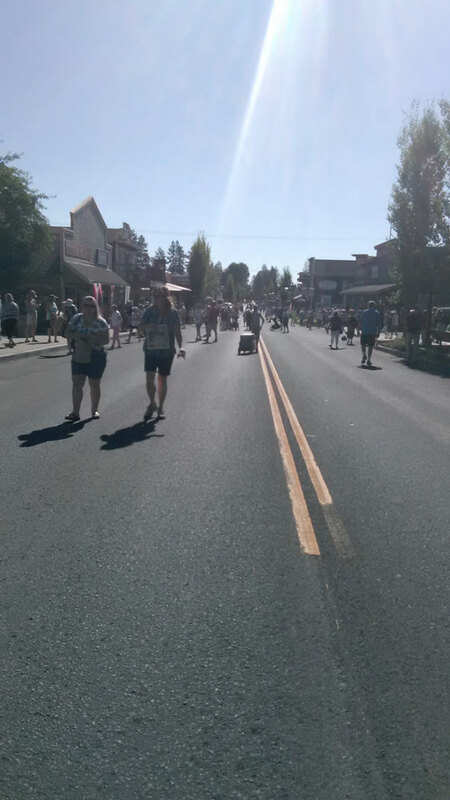 We got a lot done, and for a good cause too! At the last PMQG meeting, I was a lucky door prize winner. One of the awesome goodies was a 3-month subscription to Creativebug which is an online education site for all sorts of crafty-ness. It’s super cool! 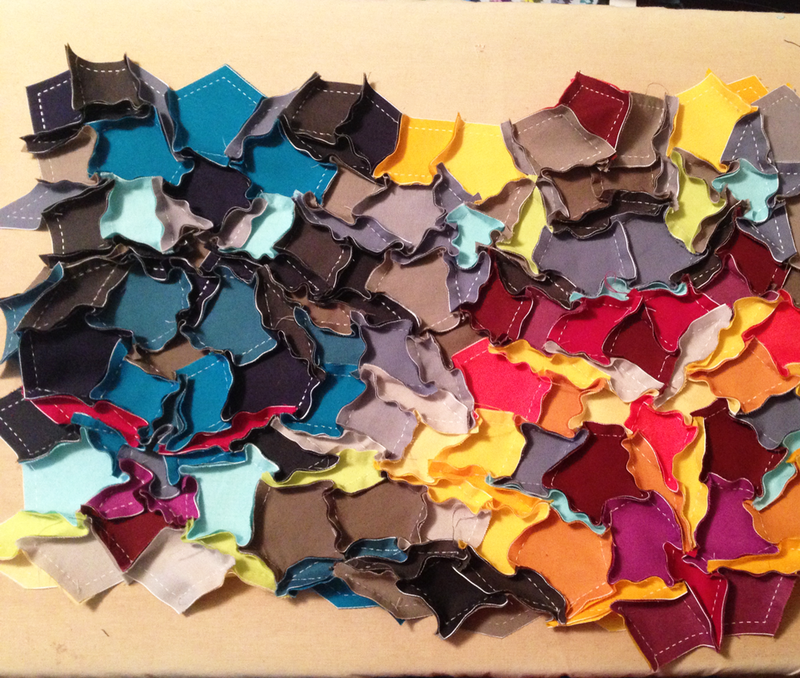 I think it took me about 2 hours from start to finish… including picking fabrics. I used some Violet Craft’s new line Brambleberry Ridge. The metallics make this a really fun pillow. 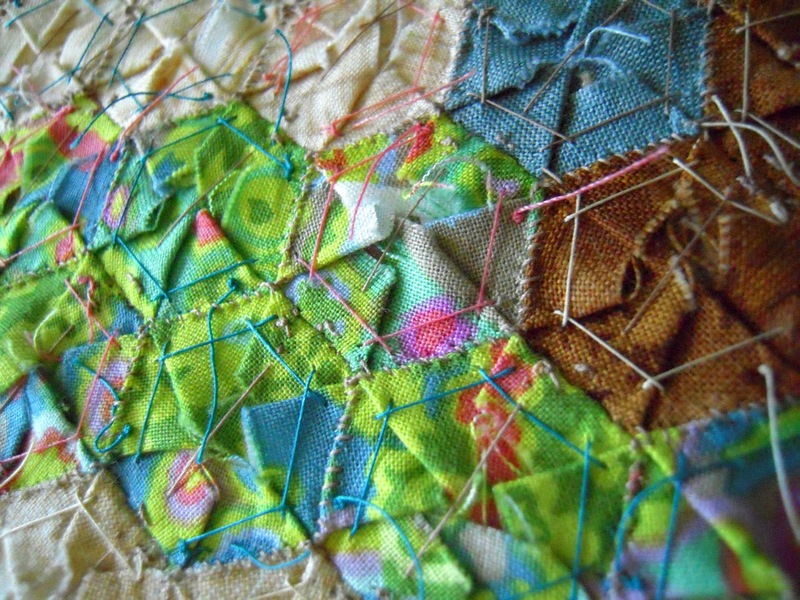 I followed Susan’s direction up to the quilting where I wanted to just play around with echo quilting – I think it gives it more of an organic feel which I like. Pulled all the blues… starting over. 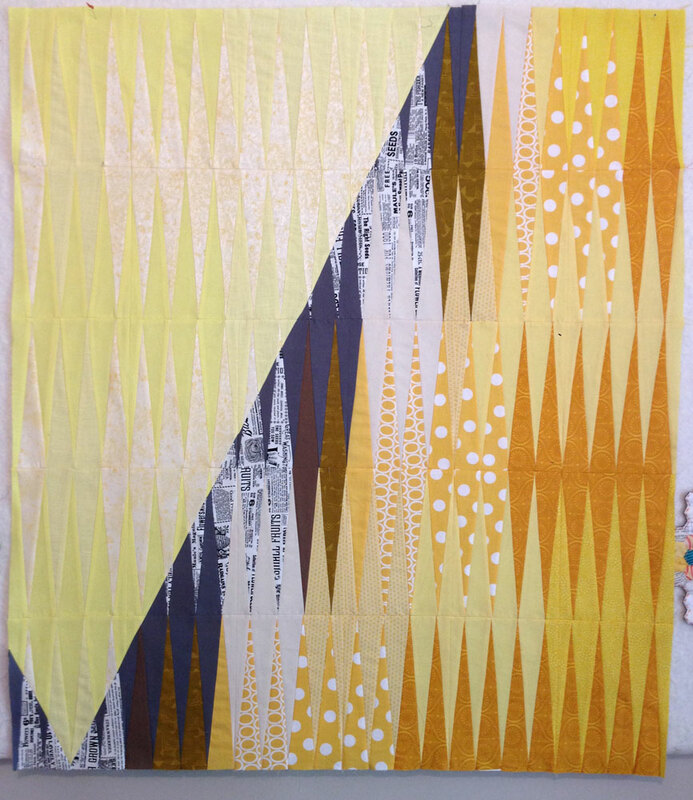 I started a project quilt a few months back, one that I planned to screen print onto – I have the quilt made, the design done… and now I need to do the pre-press to get it ready for printing. I thought you might enjoy this process, so I’m sharing! 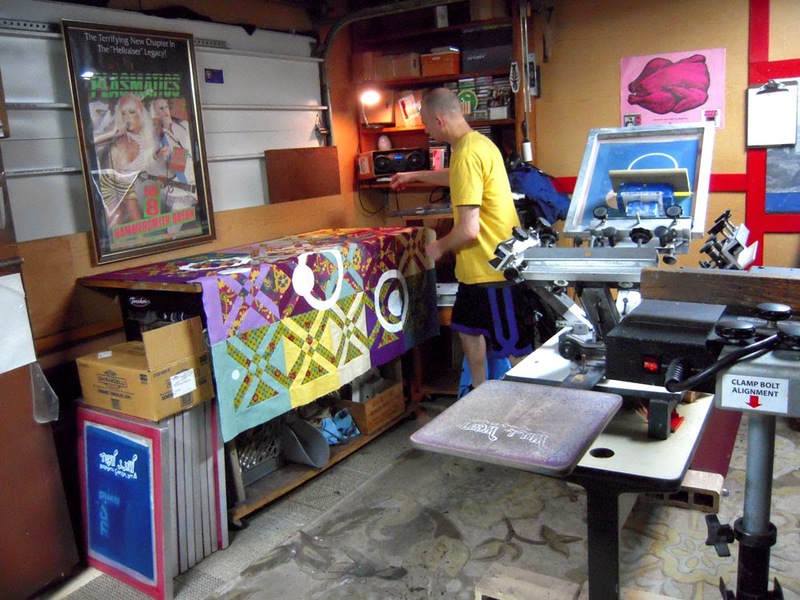 As with quilting, screen printing is very “set-up” oriented. 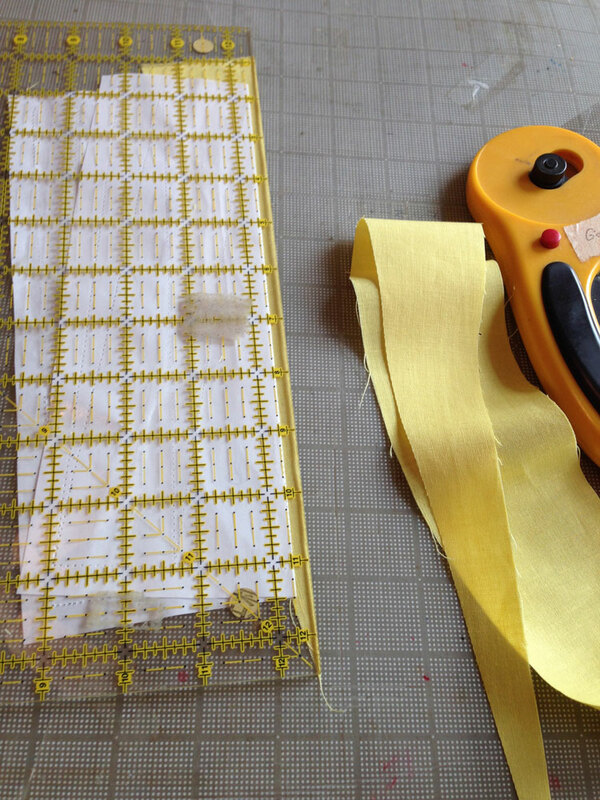 You have to plan, measure, and cut before you can start stitching on a quilt. 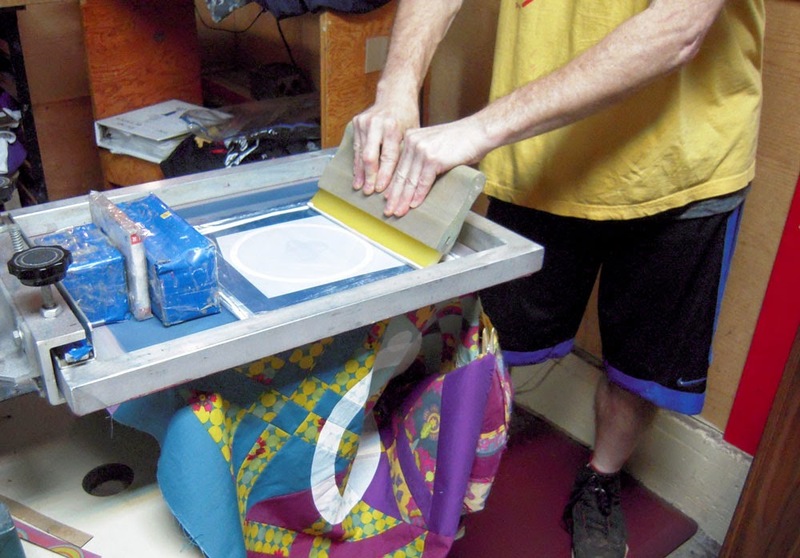 For screen printing, we need to make and set up a screen before we think about pulling ink. Pre-press is what this part of printing is called, and it’s what I do everyday for our t-shirt business. Printing on a pre-made quilt top will be a first for me and my husband, who is collaborating with me for the actual printing. 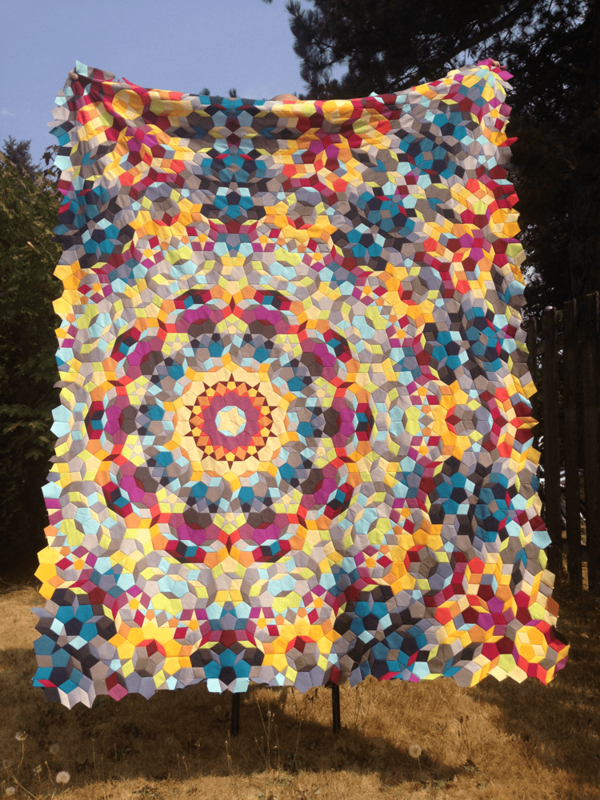 This is because our screen size is usually maxed out at a 10″x 12″ size, this quilt is about 54″x 65″… and with seams! So, the BIG question is: how are we going to print a large image? 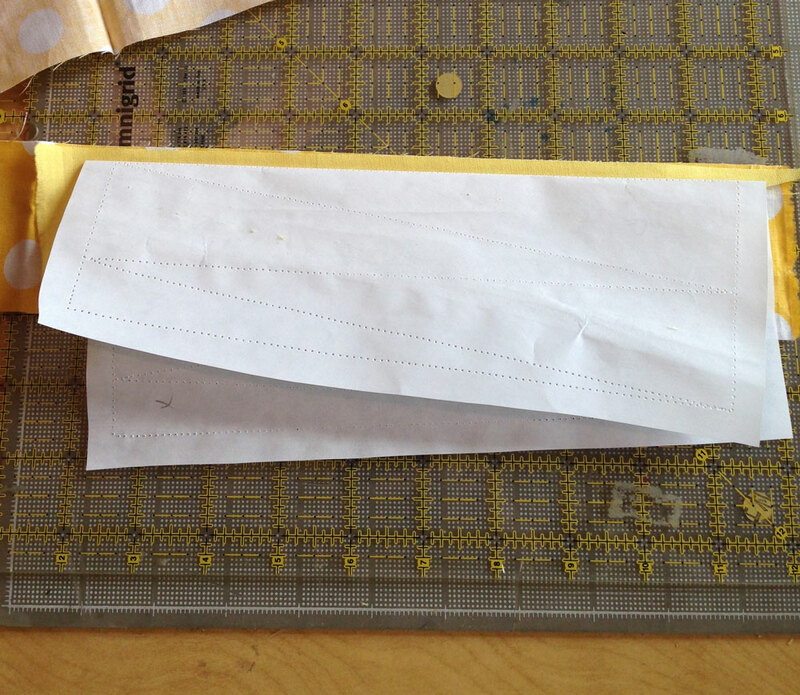 We decided to break it up into smaller bits and print in small sections with an 3/8″overlap. Fingers will be crossed tightly through this part to see if this will work. From here I laid out my design and put it where I want to see it. The plan is to use a white discharge ink which will release the dye of the fabric, rather than putting a layer of ink over the top of the fabric. Eventually I will need to make film positives from this artwork, so everything I want to print needs to be black. It also makes it easier to do the prepress. The solid black parts will print, everything else is there to help Gregg set it up “in registration” with all the other sections. These sections will become screens. The small lines are marks for where the seams of the quilt should end up, and I also have marked which block they should be in. From here, I would normally send each one of these sections out to get a piece of film positive made at a pre-press company. One of these sections would be $35 as a piece of film, since I do not want to spend that on one-time prints, I’m going to make copies on transparency stock at Kinkos. Once we have the films made, we can start the next part of the process: shooting screens. 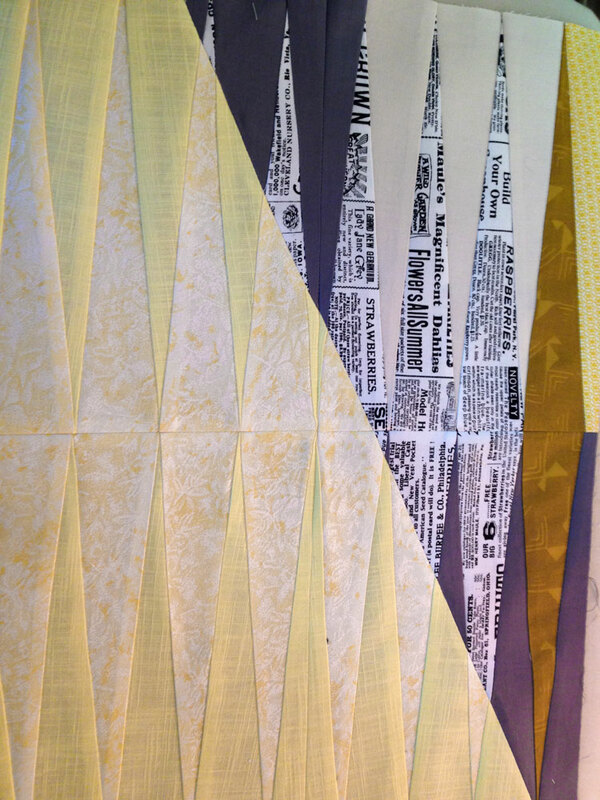 This quilt is all about process – which takes time, however… I will post as soon as we start on the screens! An idea has sprung up in my head, so I’m working on something different. I’ve seen other screen printers print on fabrics and quilt blocks, but I’m hoping to pull off printing on a finished quilt top. Actually, it would be my husband Gregg making the print magic happen. He’s been an independent screen printer for 19 years, and luckily for me I just talked him into this major project. 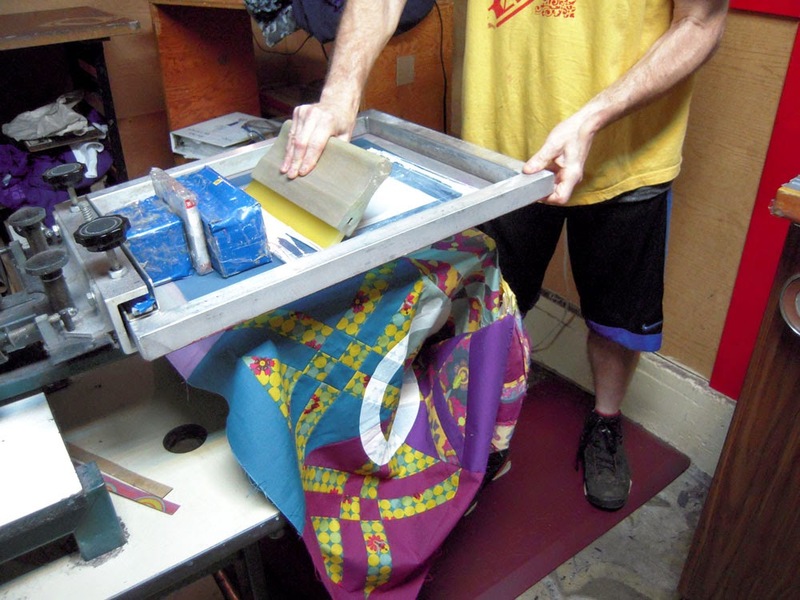 Screen printing is like stenciling, and it’s a very simple process to use a screen and pull a print onto fabric or a t-shirt. However, making the screen is where all the work comes in, and before you can make a screen – you need a design. I thought I’d walk you through my process. 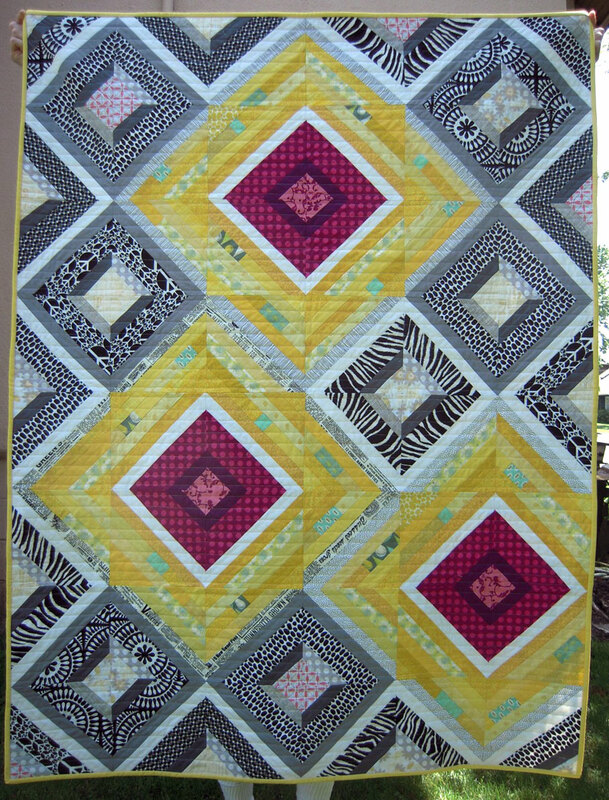 Here is the finished quilt top I made using Anita Grossman’s “Anita’s Arrowheads” technique for making blocks. 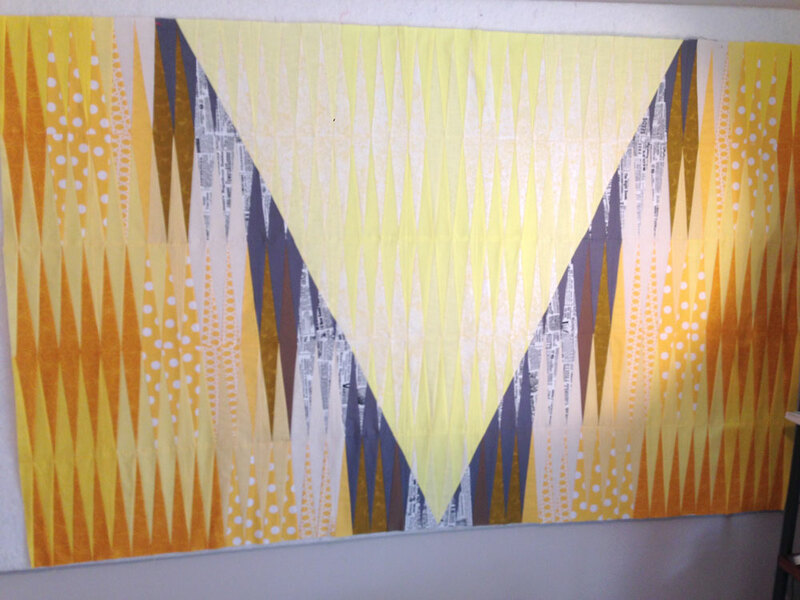 This one measures 52″ wide x 64″ tall. 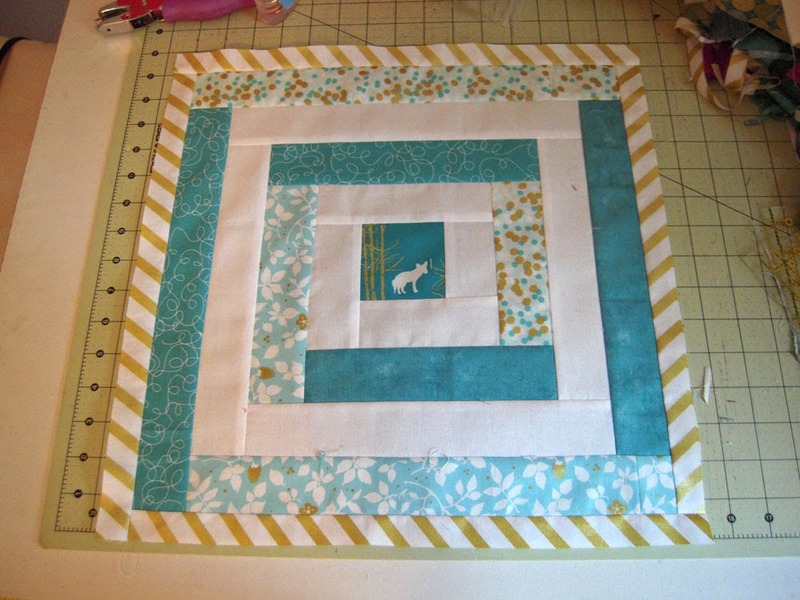 I spent a few days laying out these blocks till I was happy, then sewed them together and added a 3″ border just to make it a bit bigger. Once this part was done, I could play around with some of my images and see what would work best with this particular quilt top. It’s thrilling to finally be at this stage! Next up is to divide this image into bits that are small enough to fit on our screens. 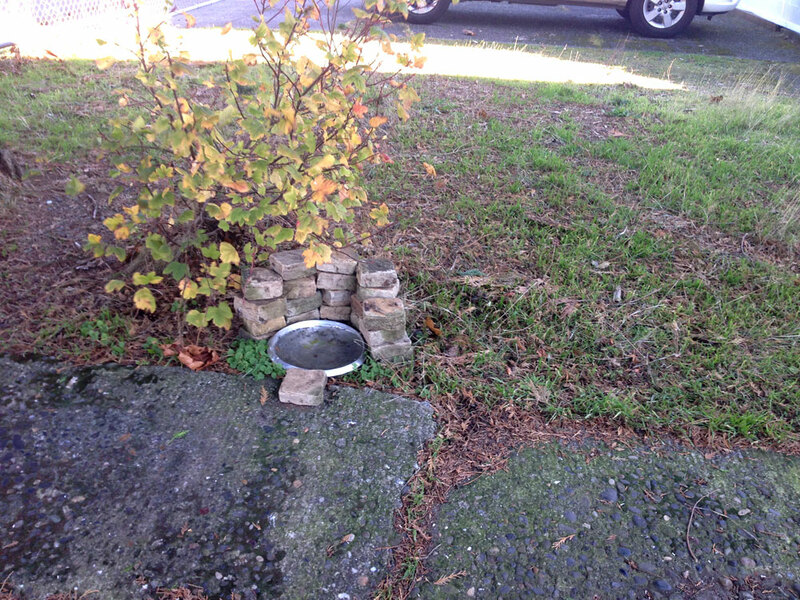 The largest image area we can use is 11″x 12″. This size works for us because our t-shirt screens are the same size – no new screens need to be purchased. So… we are looking at dividing the image up into 20 screens and Gregg will have to work his magic to make the screens match up. That is where the real difficulty will come in. We plan to use a discharge ink actually releases the dye of the fabric, some fabrics may come out looking really white, others maybe not so much. It’s a big challenge for Gregg too – we would much prefer a large format press so we could print the whole thing at the same time… but we have to work with what we got. You can see the 20 divisions above. We usually get film positives to use to make our screens, but just like film negatives, this can get expensive. 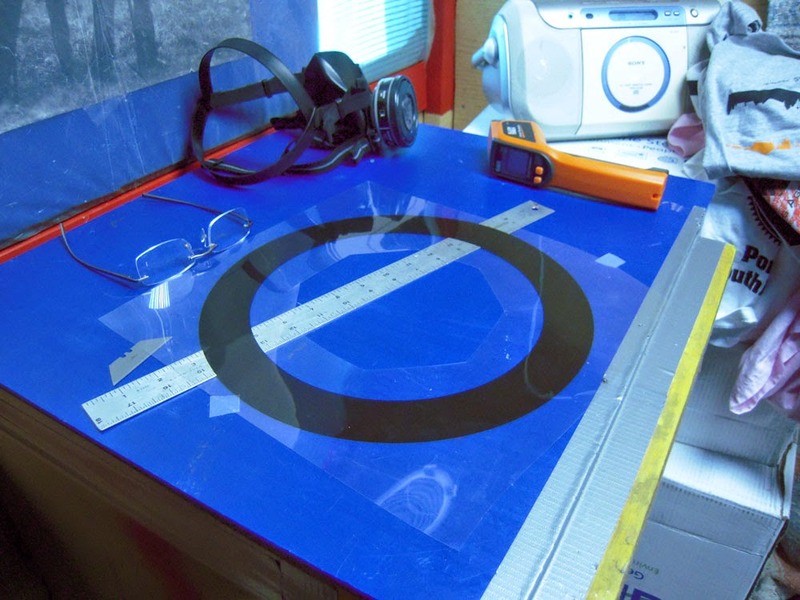 Instead we are going to use transparency sheets. Next up in this project is actually making the screens and getting them ready to print. Depending on the issues we come across, we may tweak the design a bit… or we might just scrap the whole idea altogether. I’m just happy I have someone willing to try something new with me! 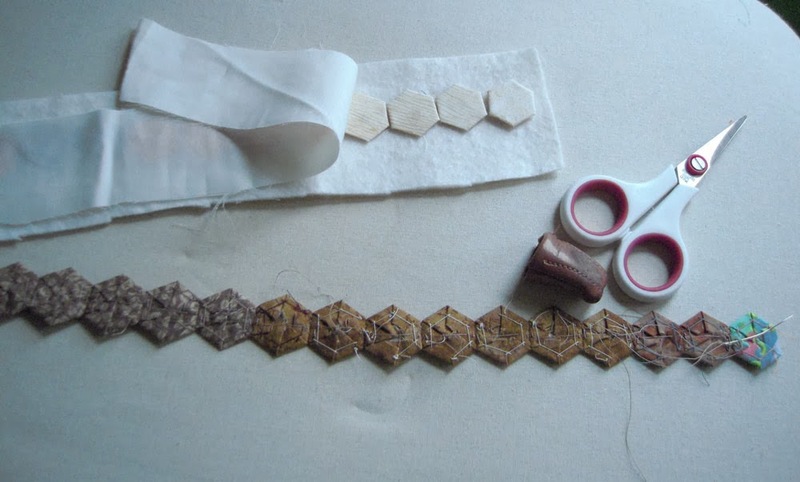 A friend of mine just asked me a bunch of questions about how I make paper-pieced hexies, thanks for the inspiration to write about it, Karen D.
There are many steps and procedures to making an English Paper-Pieced (EPP) project. 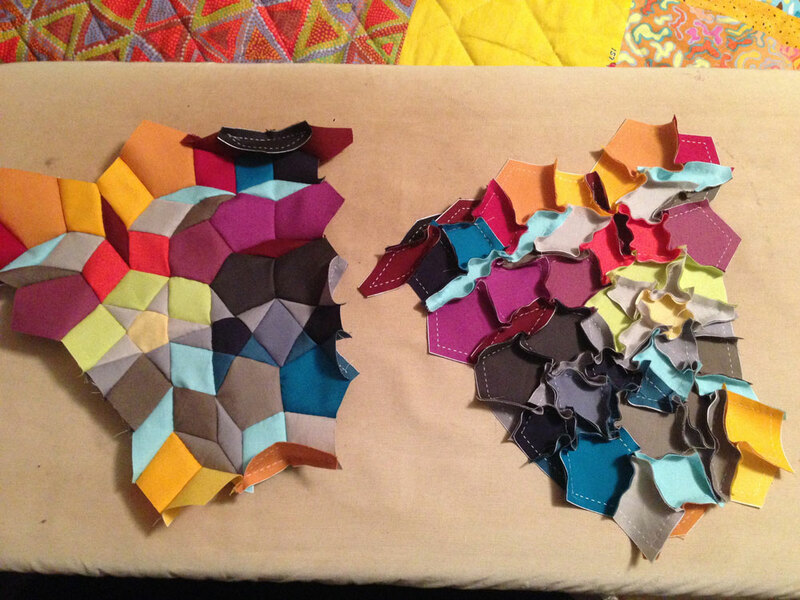 Since I’m a hexie addict, I thought I’d share a little about my process. 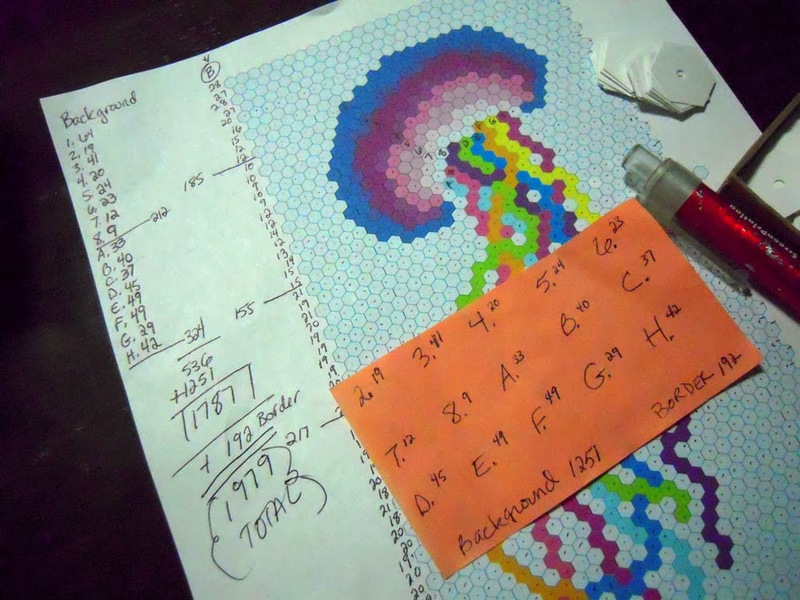 Most people think of the Grandmothers Flower Garden design when they think of hexagons. 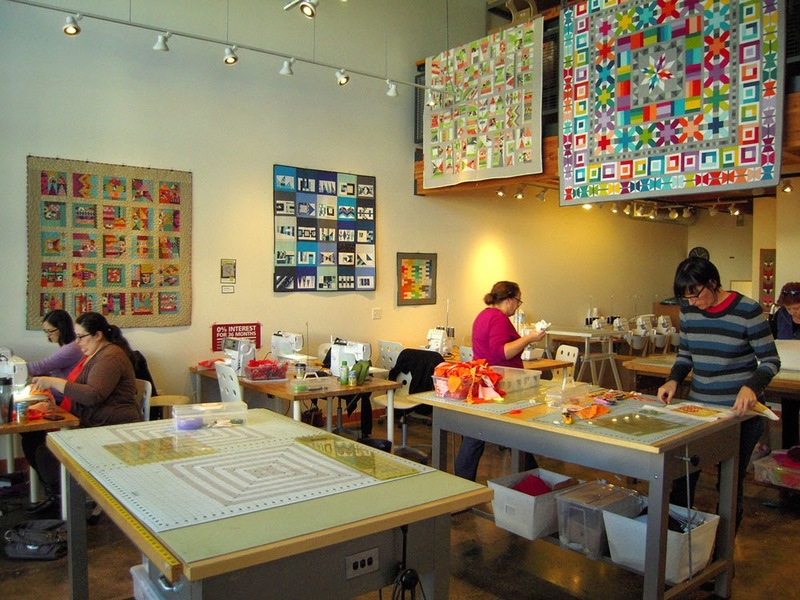 It’s a great place to start – they make beautiful quilts, and you don’t have to think too much about the design until you are sewing the actual “flowers” together. 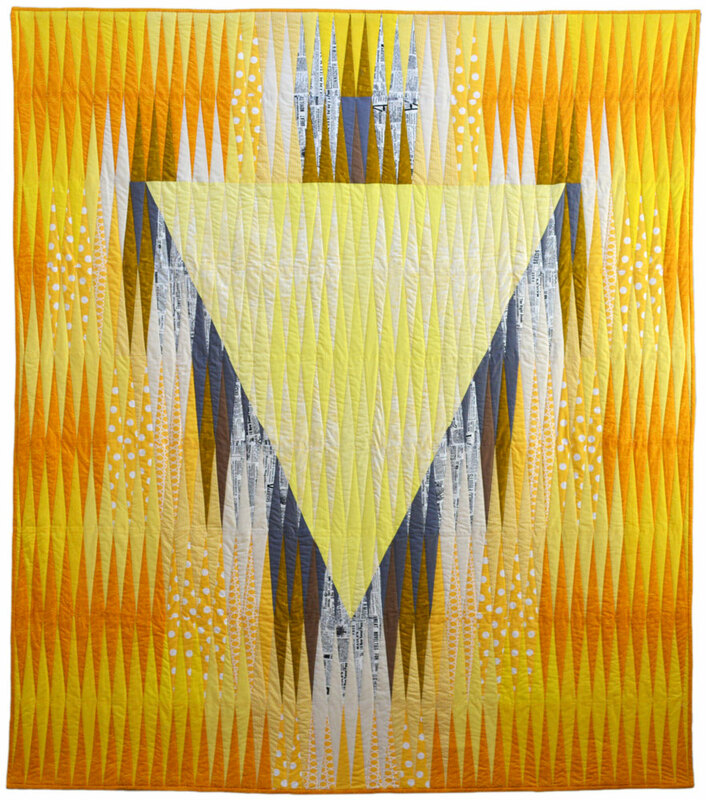 Personally, I love the idea of quilts with more of an iconic design and bright colors, almost like a show poster. 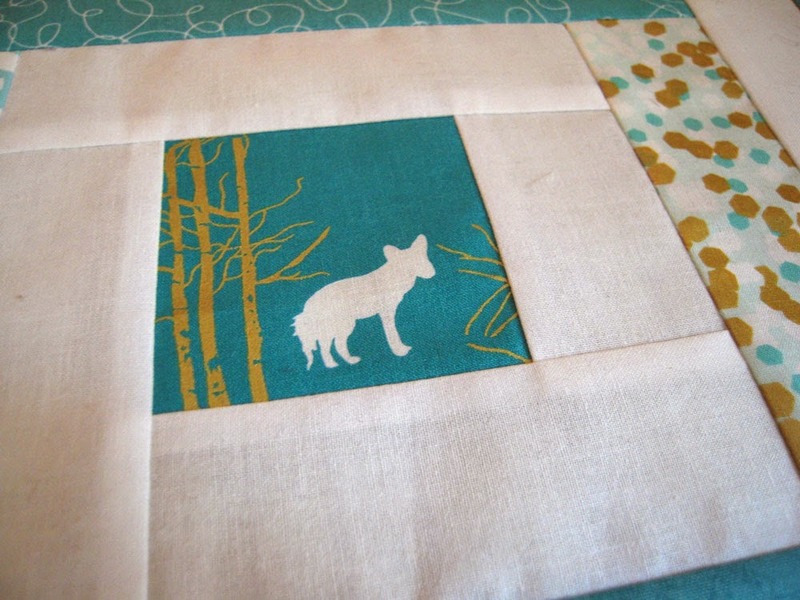 When I was shown how to make hexies for the first time at a PMQG meeting in 2010, I finally realized a way to create the type of quilts I wanted to make. 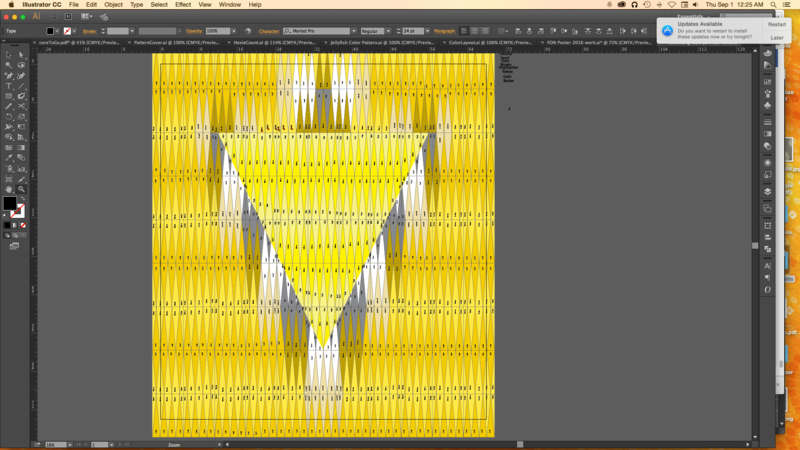 I use Adobe Illustrator to design my quilts. It’s a great program, but sometimes I wish I used a program that figured out your fabric requirements for you. One of those programs is the Threadbias Design Tool, I’ve heard great things about this one, but haven’t used it myself. In Illustrator I work with color to differentiate between colorways… but I may not use the same colors in fabric as the design illustrates. I create the design in actual size on the computer so I know how big it will be. 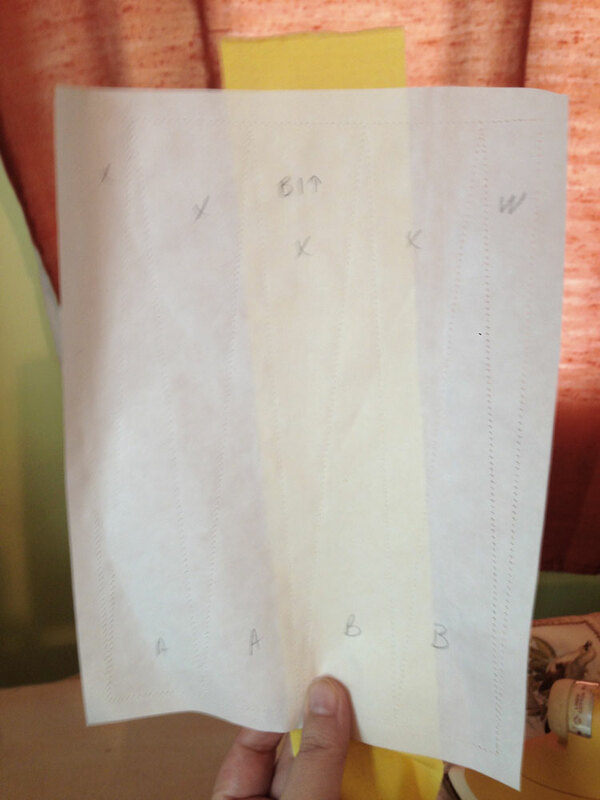 The image size is reduced to fit on a sheet of paper and I print it out, and that becomes my pattern. 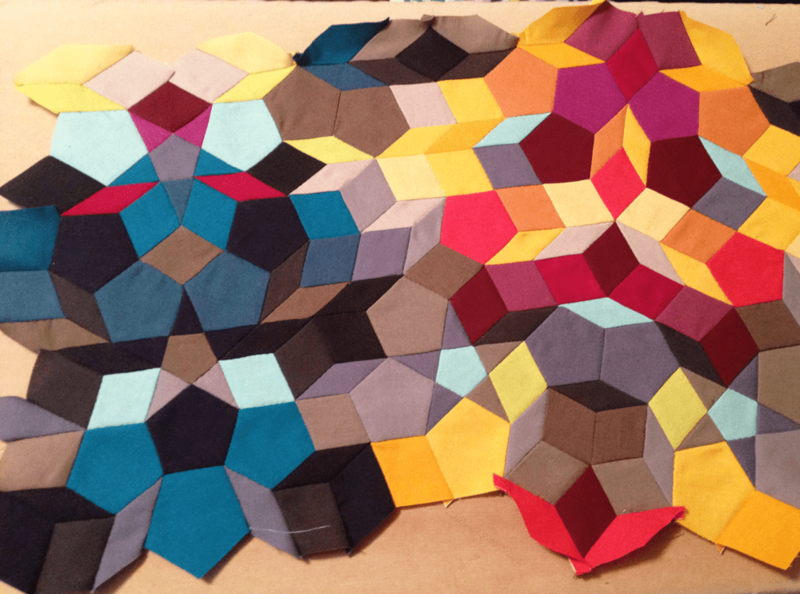 I name each colorway, and count how many hexies are in it. Once I have my counts, I get my hexies out. 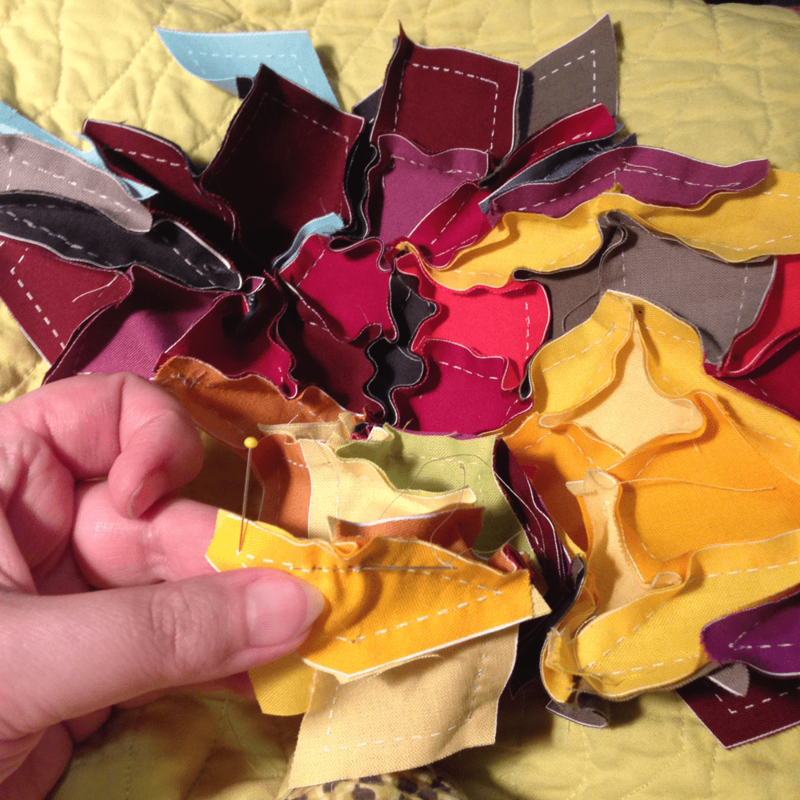 Before I do ANY sewing, I take the time to punch a hole in each hexie. This step is very important! 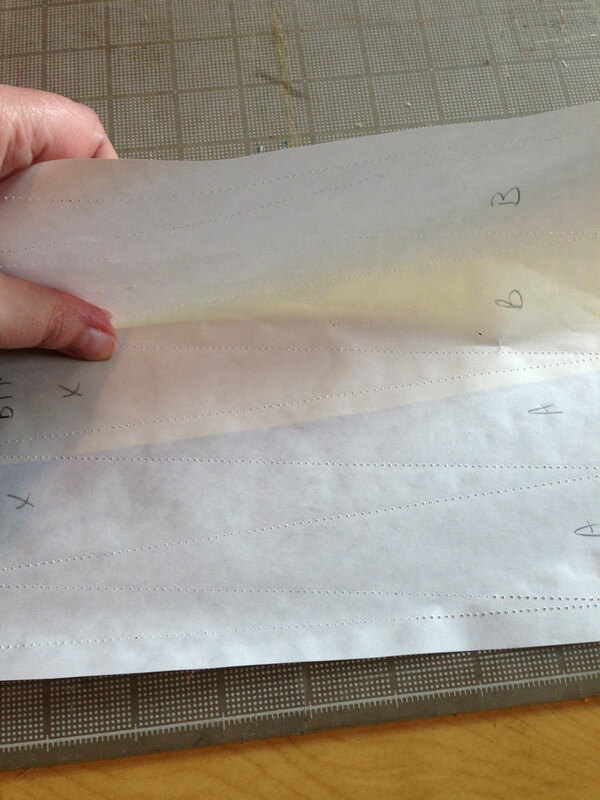 It will save you so much time when you are done with your quilt top and need to take these papers out. 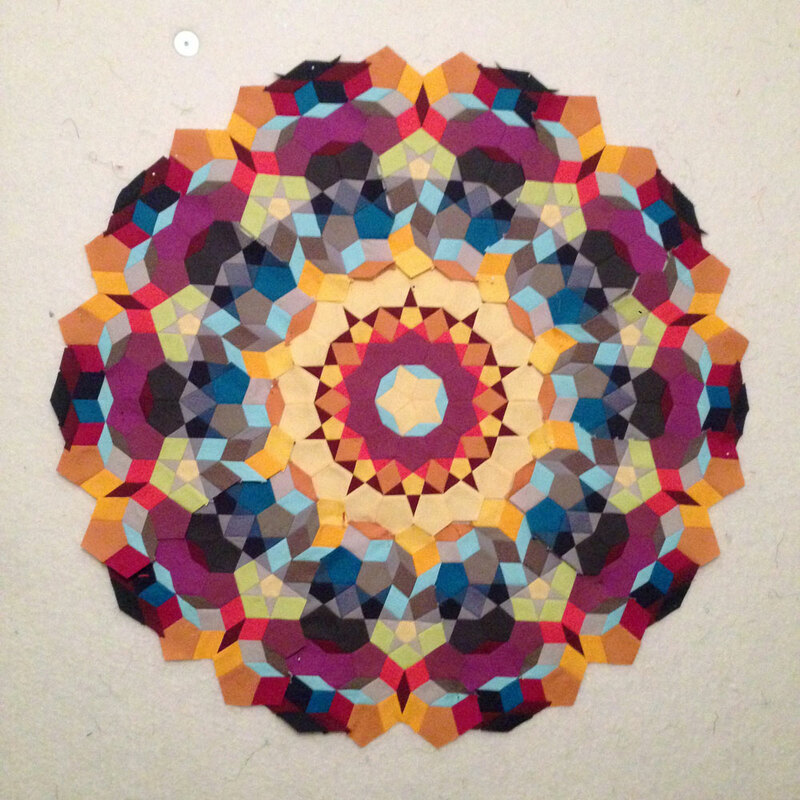 I use paper pieces from Paperpieces.com. 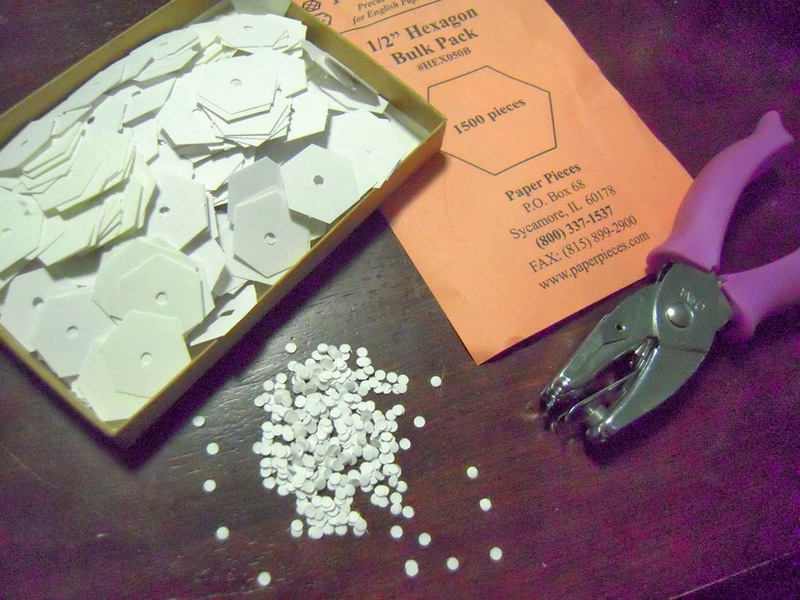 It is worth the money to have exact sized pre-made hexagaons! I only wish they came with a pre -punched hole. I’ve never used plastic templates or cut them myself from old cardstock. I know some have had great experience with this… but not me. Seems to take way too much time. The last thing I do to get ready is to prep a layout board. 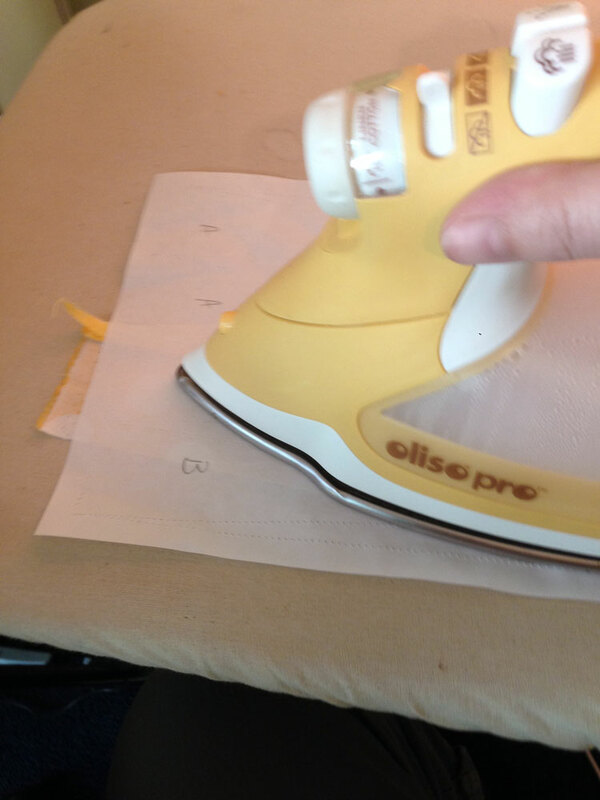 You can use a design board (rigid foam insulation covered with batting that rolls over to the back and is taped to the backside – here is a tutorial) to lie on a table and hold your hexies for layout before sewing them together. The board should be bigger than your finished quilt size. 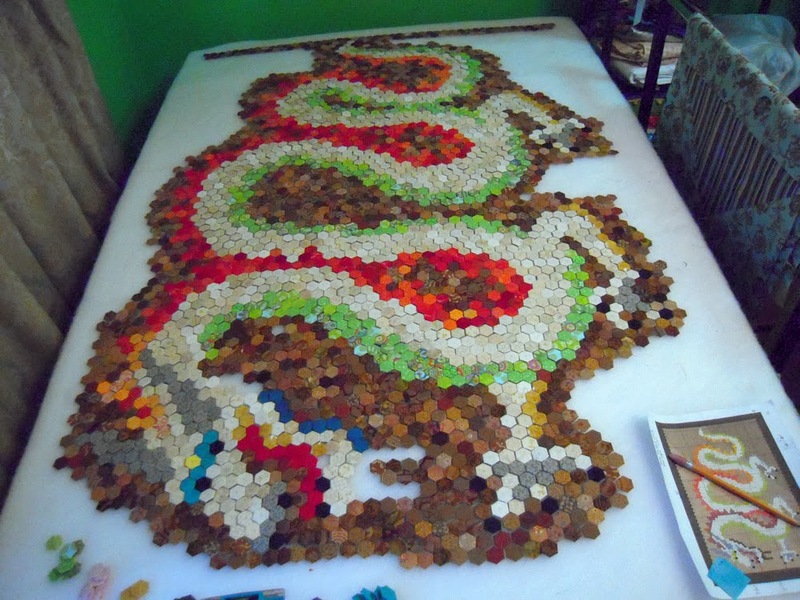 When I laid out the Dragon quilt, I used a 4’x6′ board which was just barely enough space to work within. 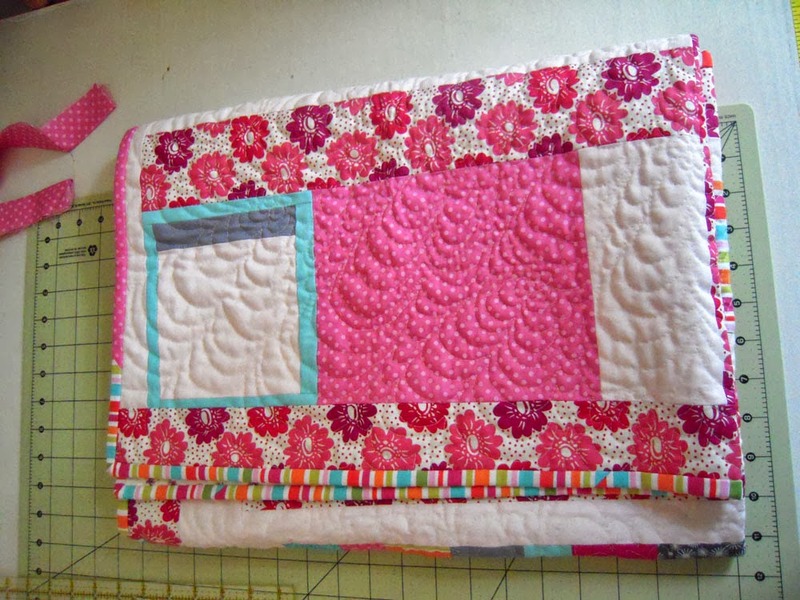 This board will need to find a good flat home for as long as you are sewing this quilt together. 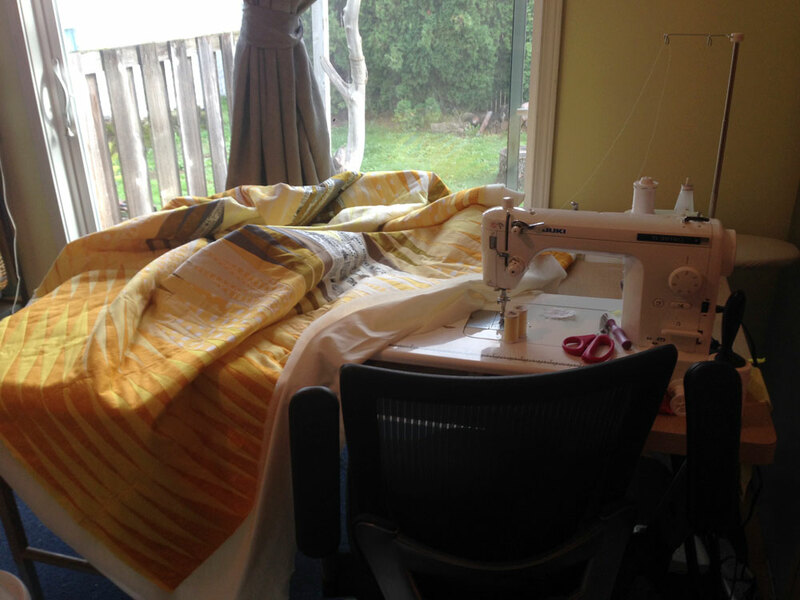 I was lucky enough to have the space in the corner of my sewing room, but while I was sewing it together, I was very limited in what I could do in my workspace. 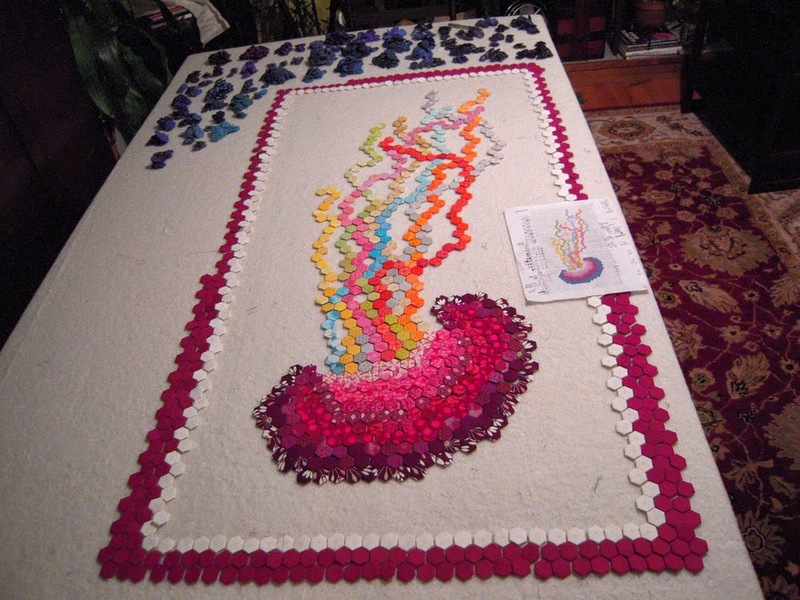 The Jellyfish I’m currently working on will be about 2’x4′, much smaller, but still tough to find space for it. It’s an issue I’m still pondering. 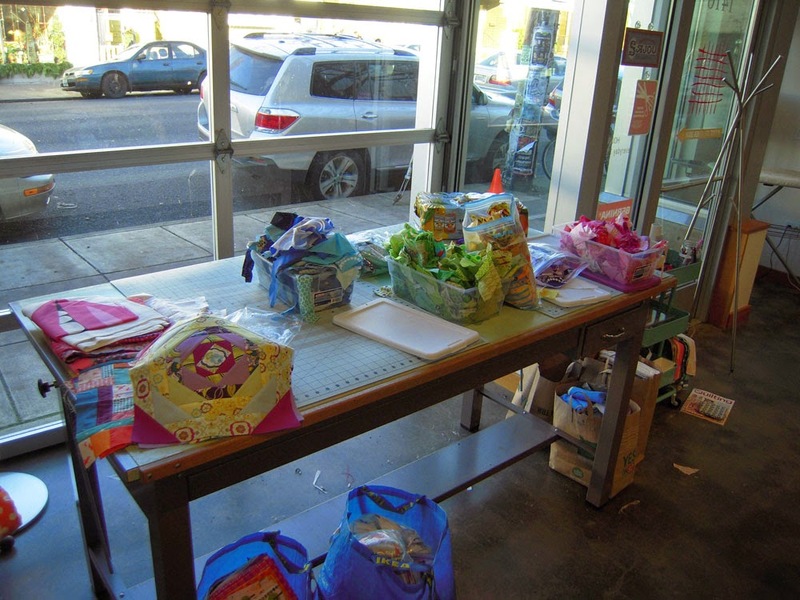 Once you have your board ready, design done, and hexie pieces prepped, it’s time to put a sewing kit together! 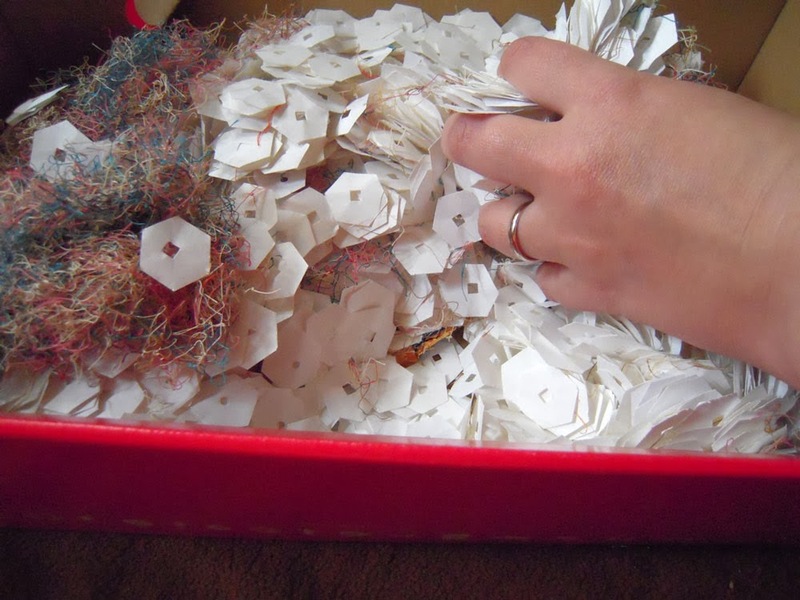 You’ll want something that can hold 50 finished paper pieces (you have to work hard to make that many in a day), a small scissors, a whole package of needles, a thimble, a spool of thread, and space for 50 fabric squares. 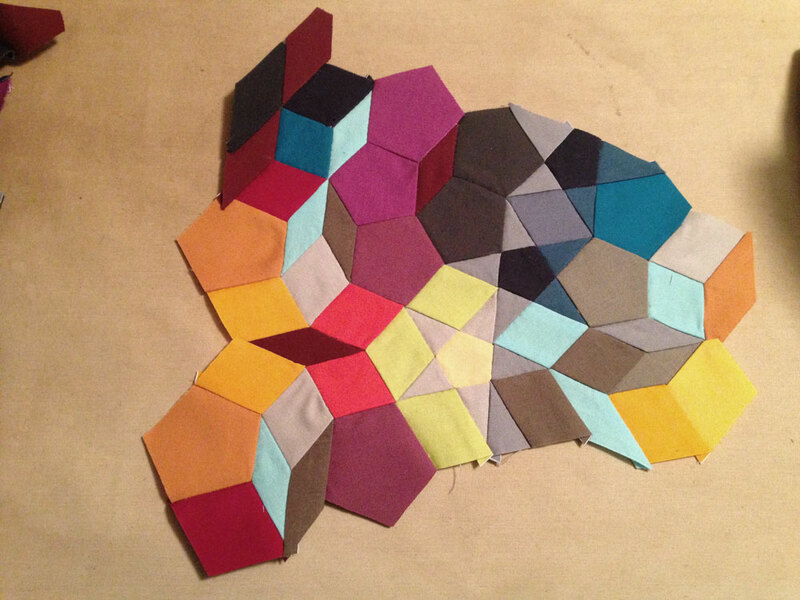 For the 1/2″ hexies, I prefer 1.5″ squares of fabric instead of an actual hexie shape with a 1/4″ seam allowance. 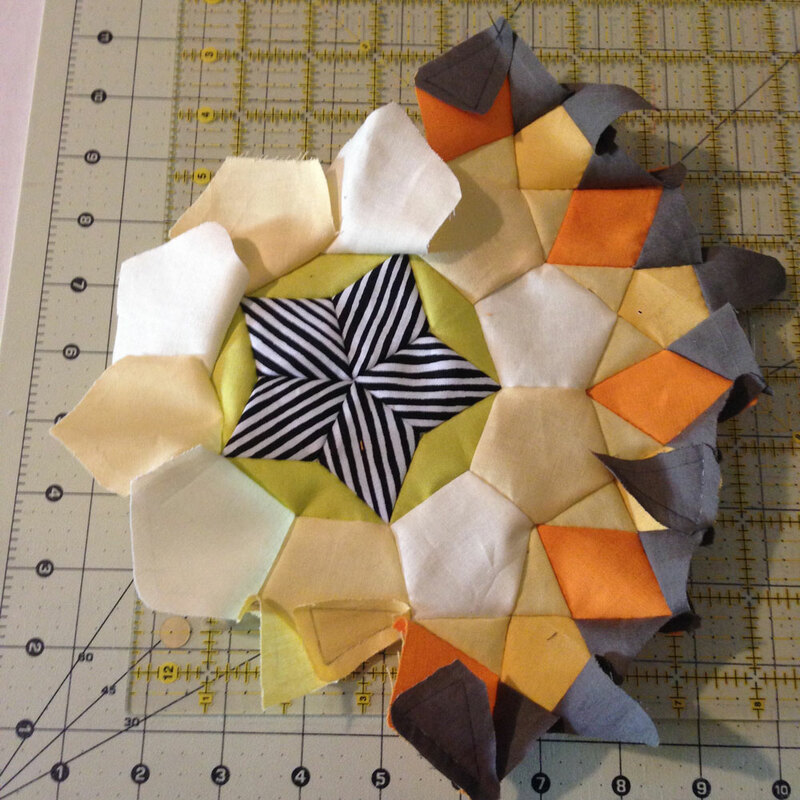 It’s much faster to cut the fabric pieces that way, and I like how they bulk up (after being quilted) with the extra layer of fabric on the backside of the hexie. Here is a ‘not so great’ video I quickly made just to show how I sew each one together. 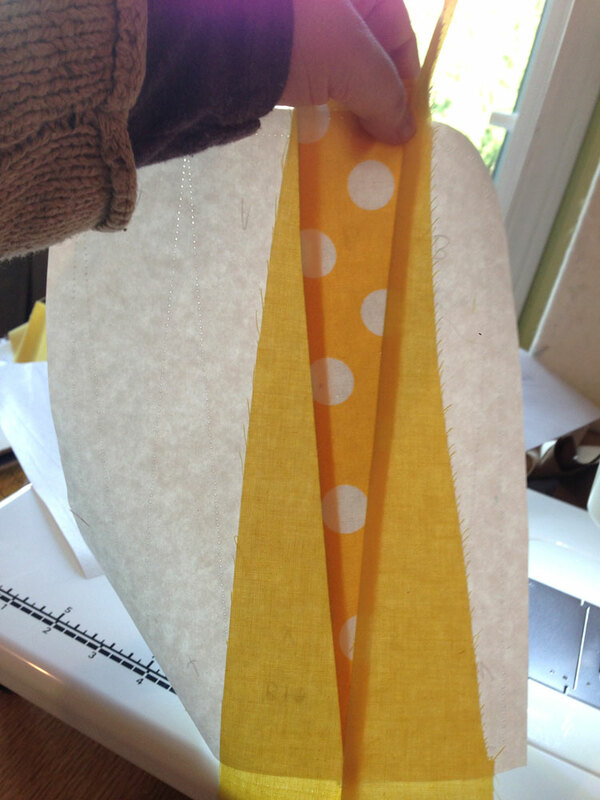 I don’t sew through the paper template, just the fabric. 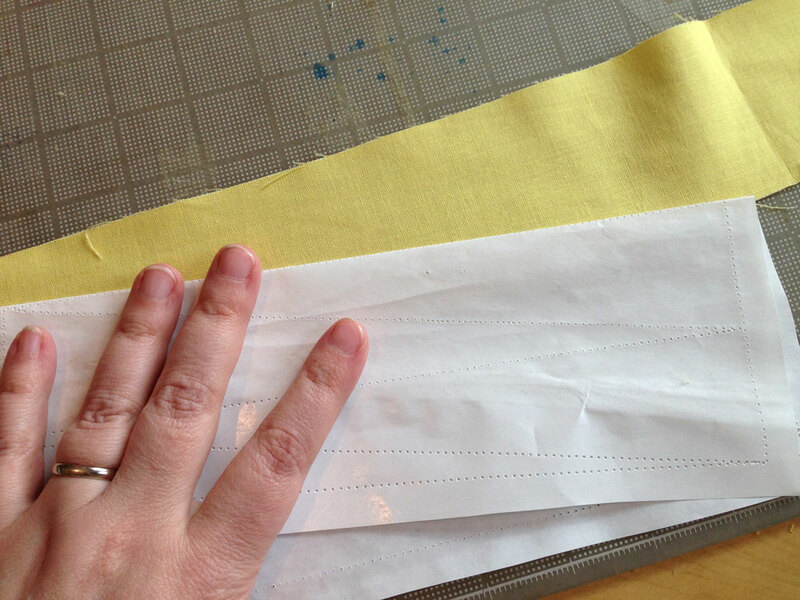 The main trick is to make sure the fabric is tight around the paper template each time you make a stitch. 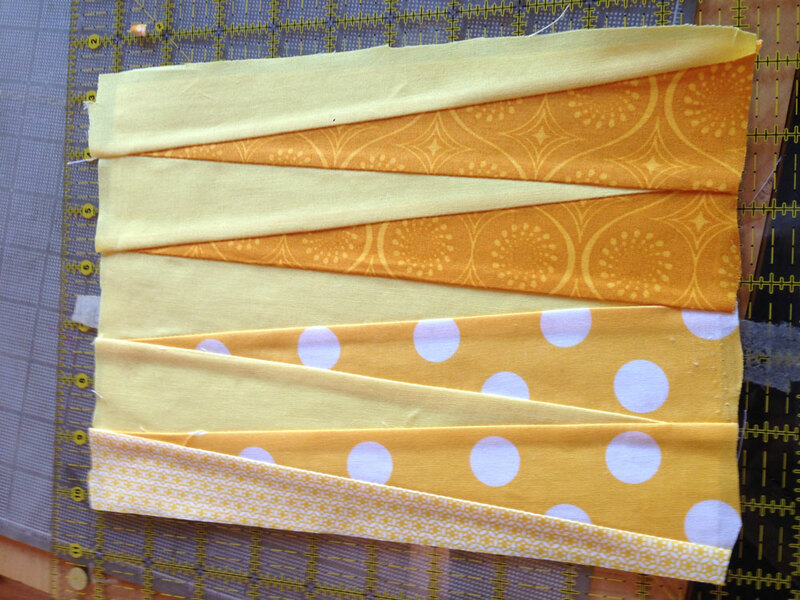 Because these are 1/2″ hexies, I only need to sew the corners. 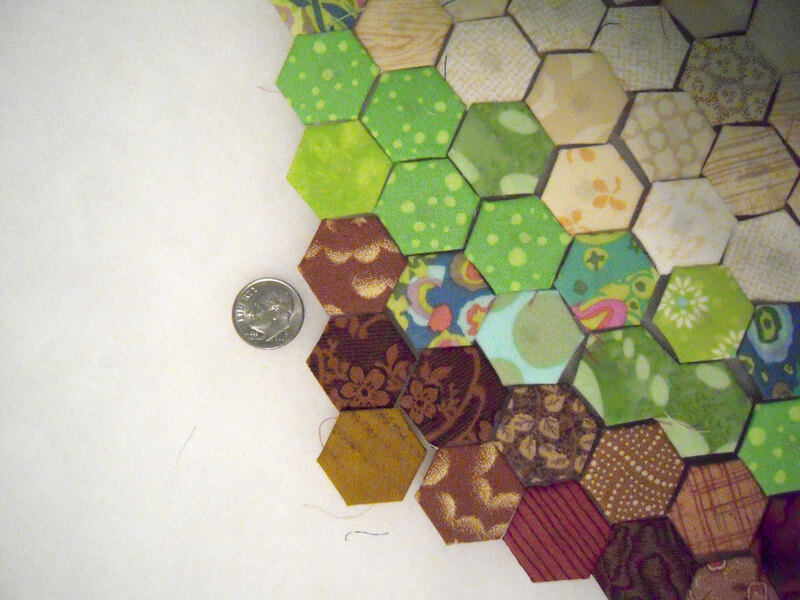 The same works for 3/4″ hexies too, but once I get to 1″ or larger, I have to sew through the paper. 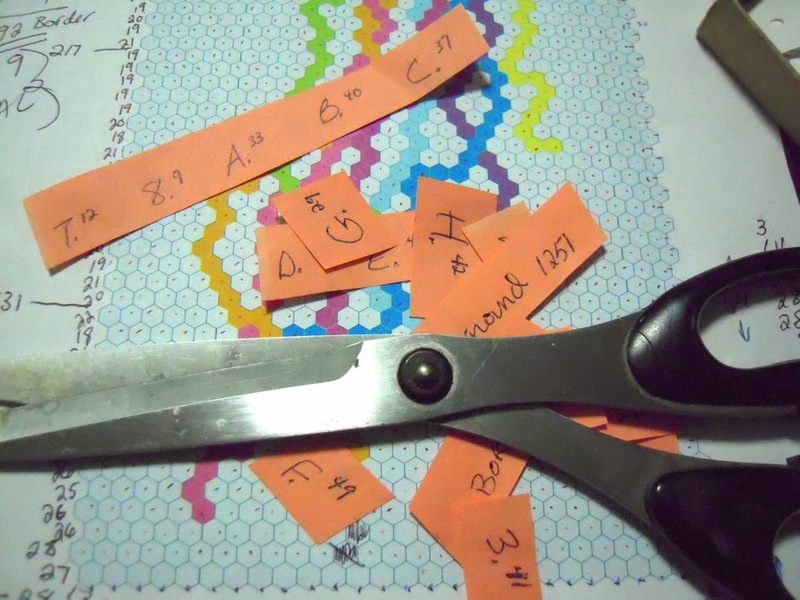 Once I have all my hexies made for a quilt, I lay them all out on the layout board I discussed earlier. 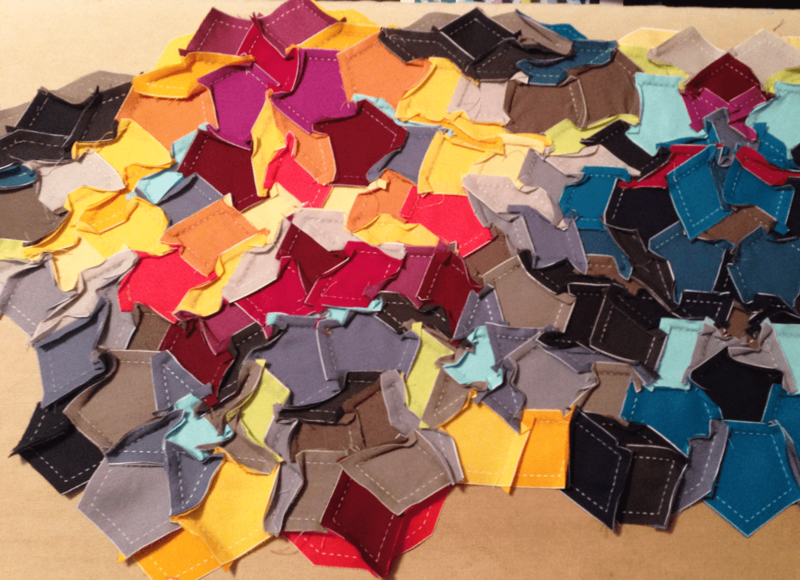 This part is super fun, but I can become obsessive with finding just the right spot for each hexie. 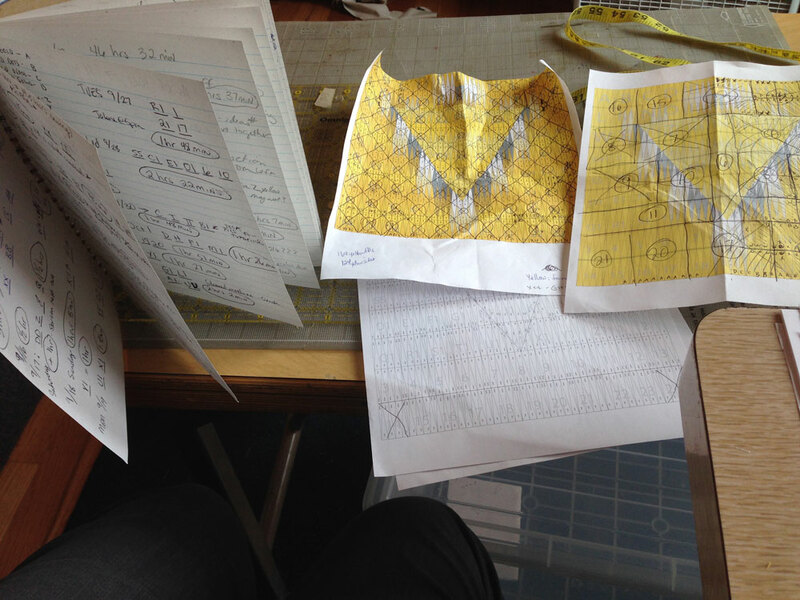 By laying them out before sewing, you have full control of how the design will look before stitching them all together. 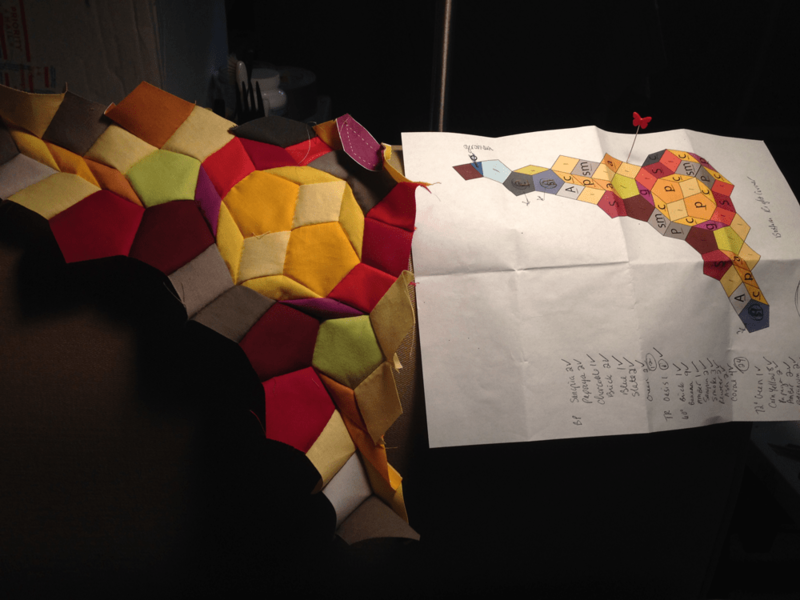 When the hexie pattern is complete on the layout board, I pick a diagonal row to start stitching together. Here in the squid quilt, you can see the row I was working on because it’s missing. 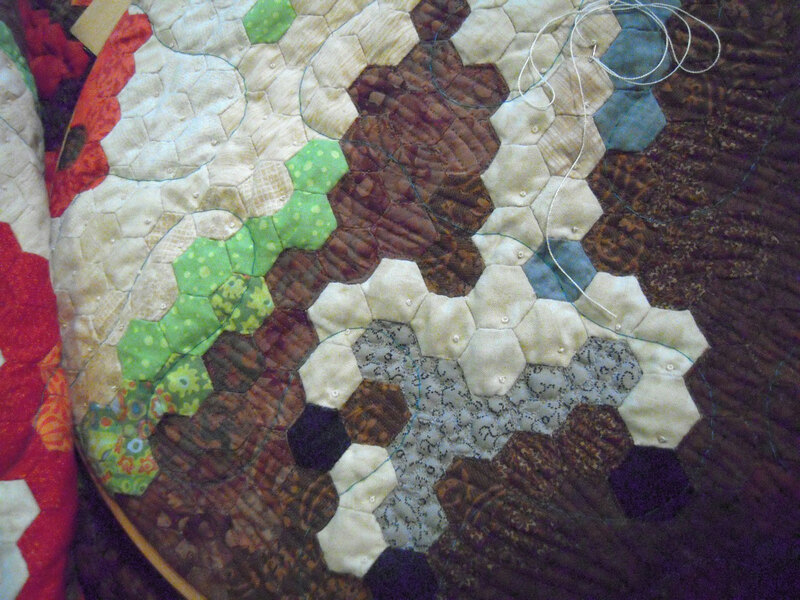 To stitch the hexies up into rows, I start with two hexies WRONG sides together. 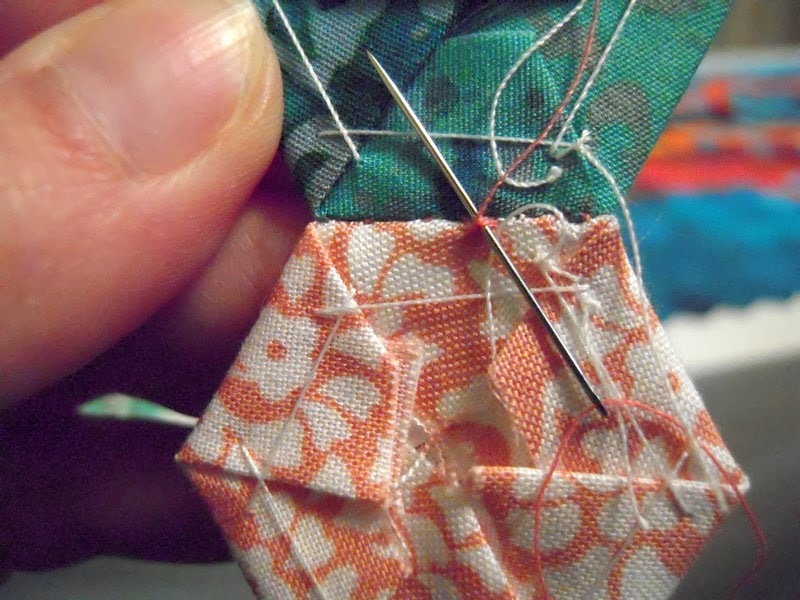 Using a ladder stitch, I start from the center, work to one side, then the other, then back to the center to tie a knot and secure it before moving onto the next hexie in the row. 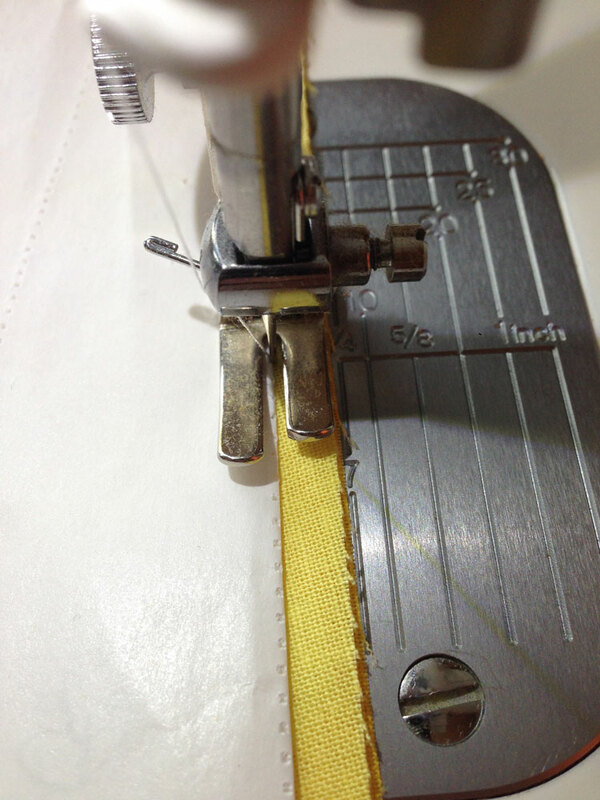 How did I keep my pieces straight to know exactly how to sew them together? 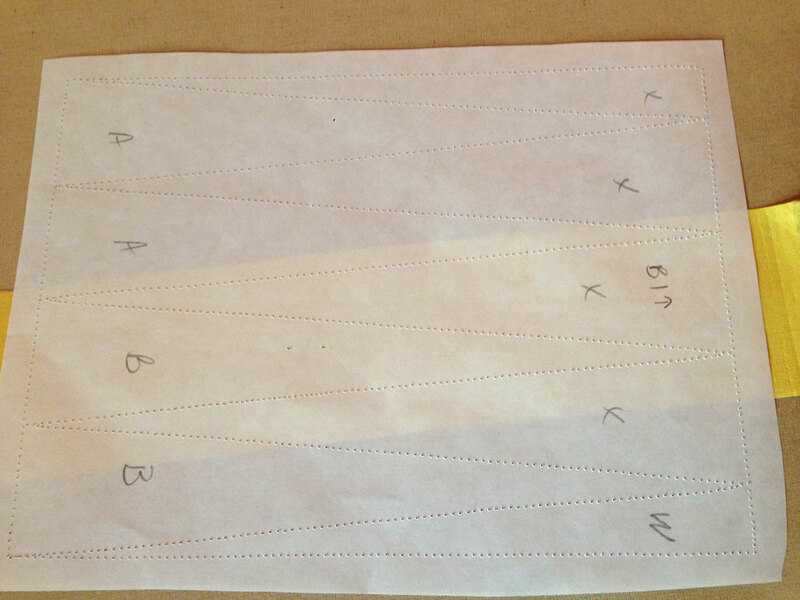 I made a “tool”: I used a 2″ wide x 18″ strip of batting to carefully set my row of hexies on in the order they were to be stitched, then I covered that with a 1.5″ wide x 18″ piece of fabric. Then, starting from the furthest hexie, roll it up. 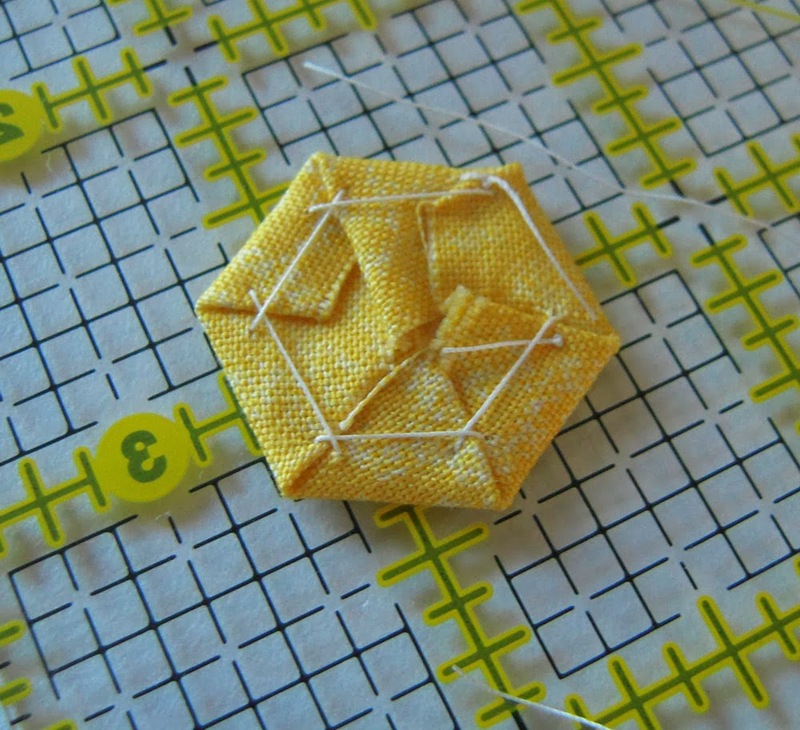 As you open your “roll” for work, it should start with the next hexie in the design. I stick the roll in a little plastic container with the batting on the bottom and carefully pull the batting as you need hexies, they will pop out like a little Pez dispenser, and you can roll the “used” batting under the other side as you go. I may need to make a little video for this at some point too! 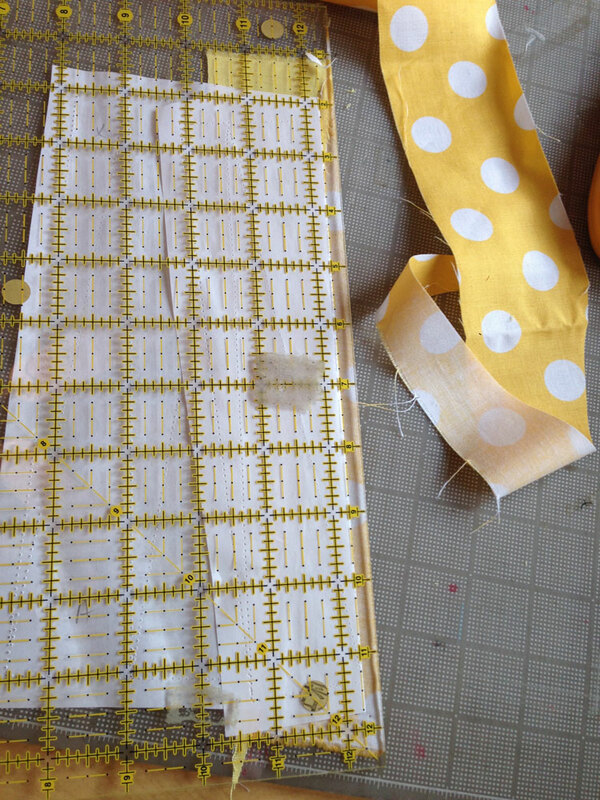 Sewing these strips takes some time, as they are finished I put them back on the layout board and keep going. 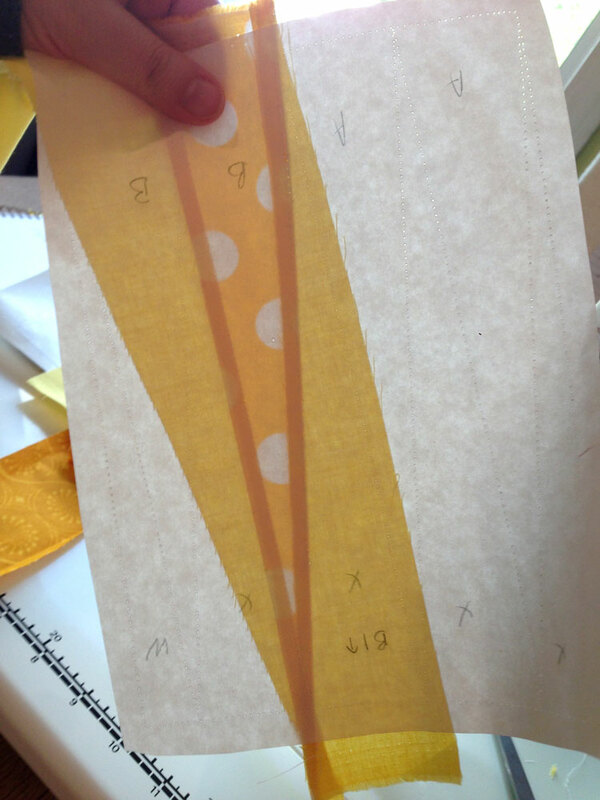 In this photo, you can see the middle strips are sewn. 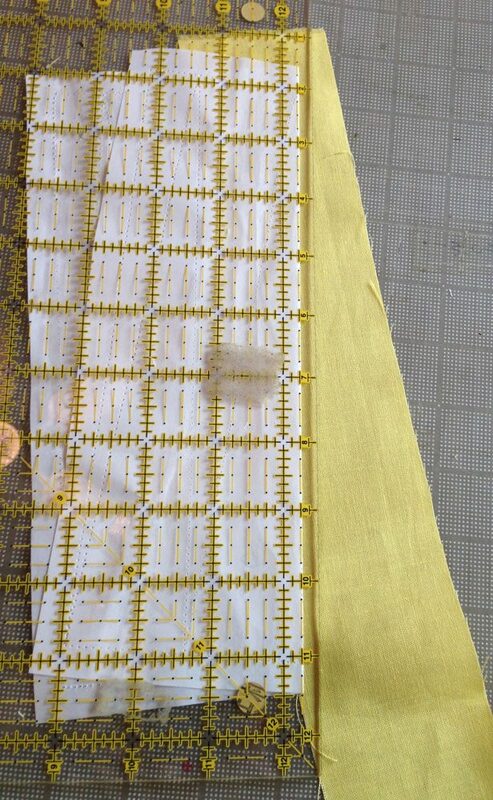 You WILL need a thimble for this work, and even still I ended up with a nice callous on a couple fingers. 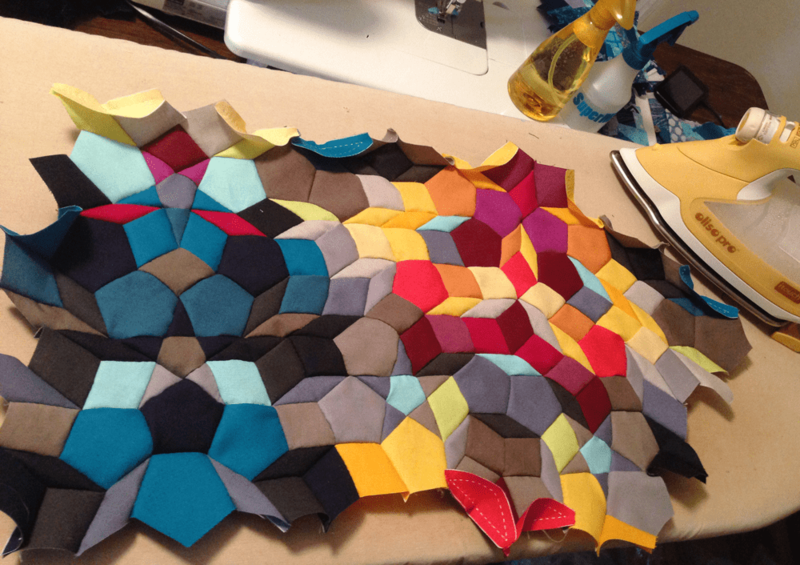 The last bit is to sew these rows of hexies together. I personally found that it worked best (for me) to lay the piece flat and whip stitch together making knots at every corner point. 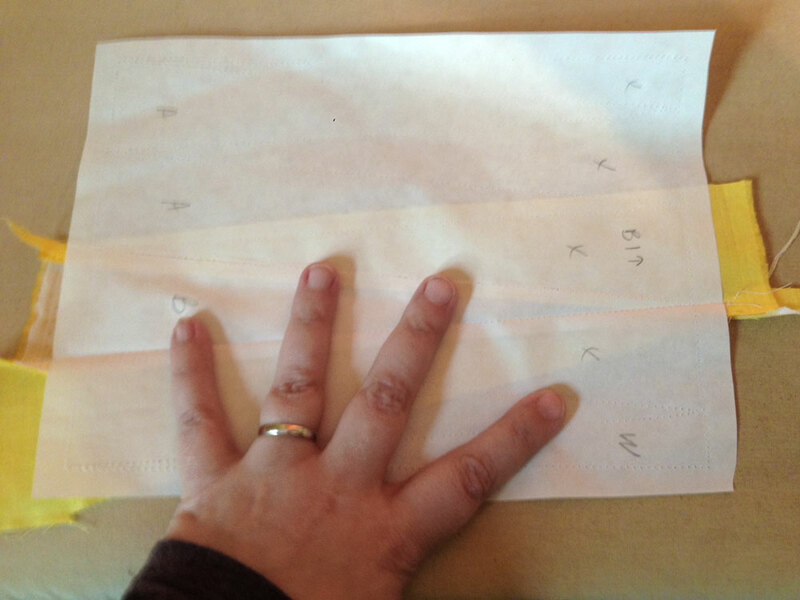 Here is a picture of the seams on the back of the dragon quilt before I took out the basting and papers. 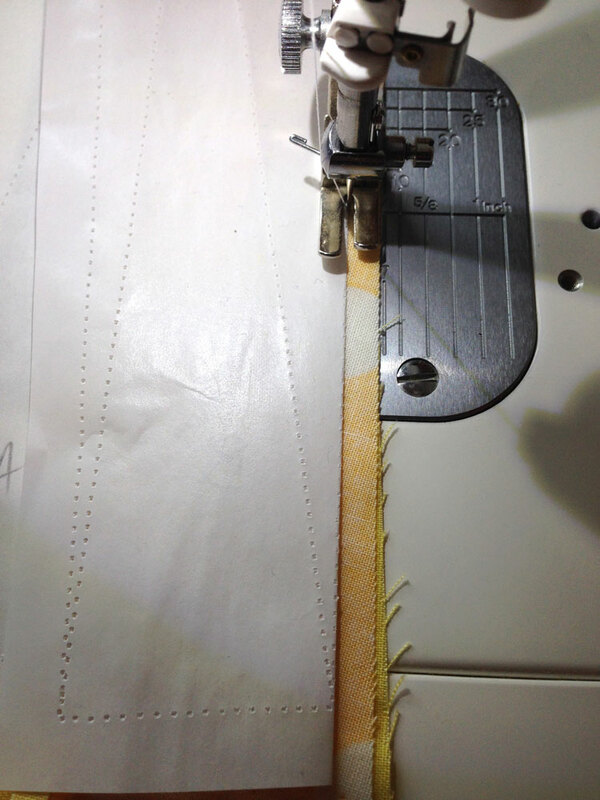 When all the rows are stitched up, you can take out all the papers. 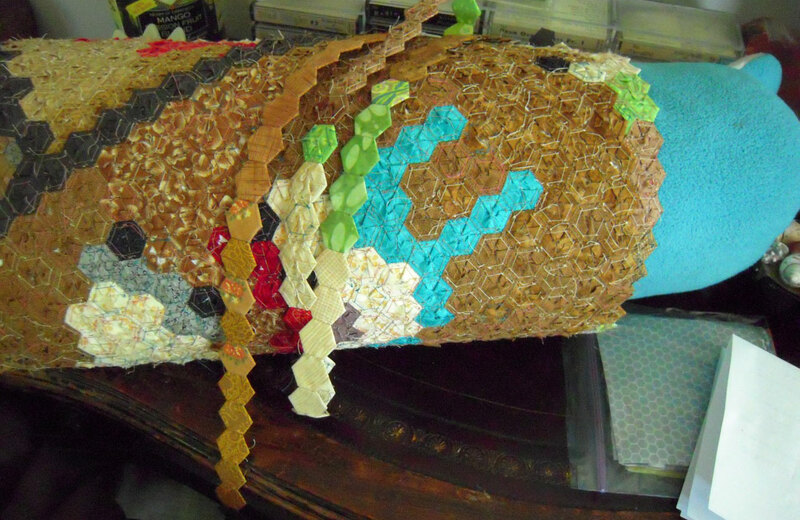 First I go over the whole quilt snipping the basting on each hexie, I leave the thread in place. 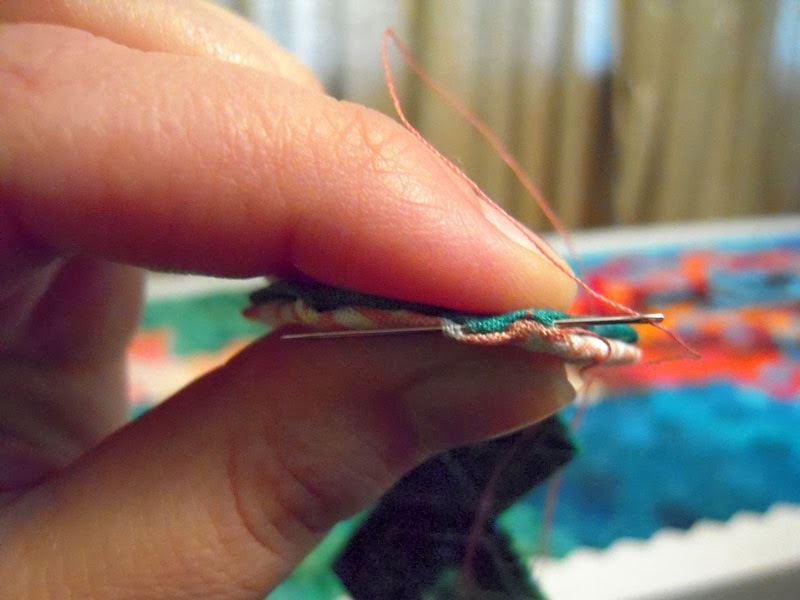 Then I use a toothpick and “grab” the hexie by the punched hole with the toothpick and just pop them out. 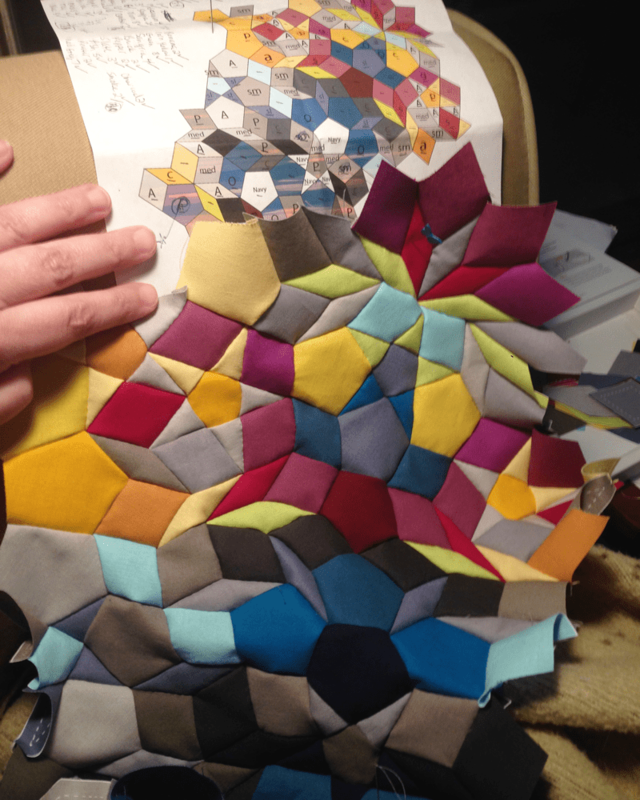 When you’re done you end up with a big pile of hexie papers. On this quilt I also picked out all the basting thread. 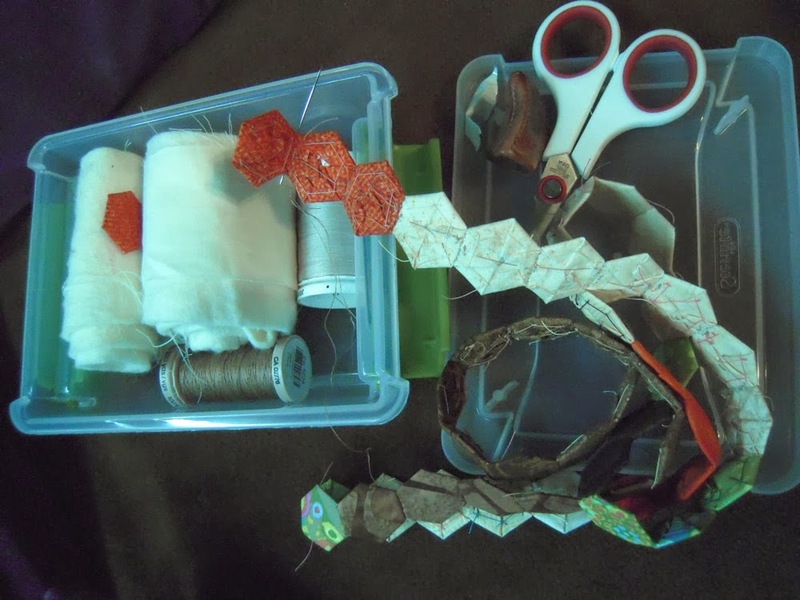 So that’s about it for the way I make my hexies… how about you? 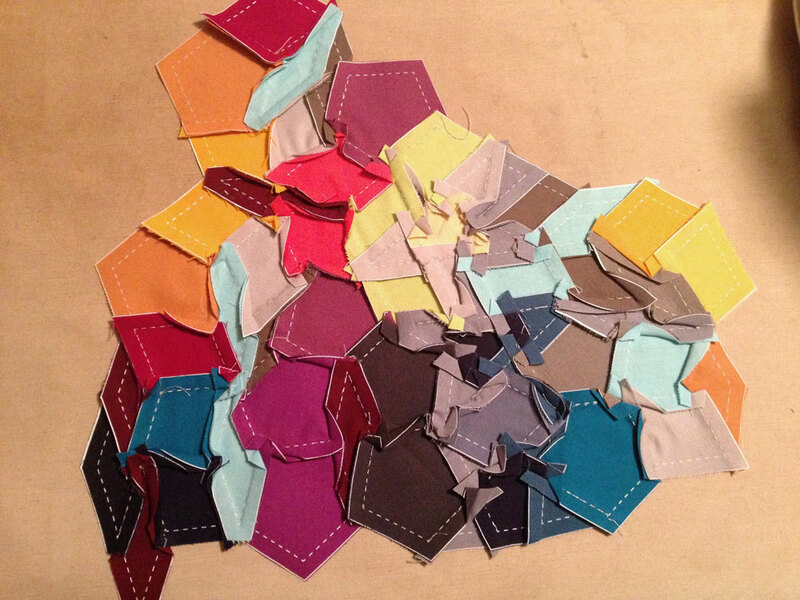 Do you have any fantastic hexie tips to share? I’m really loving this little quilt. 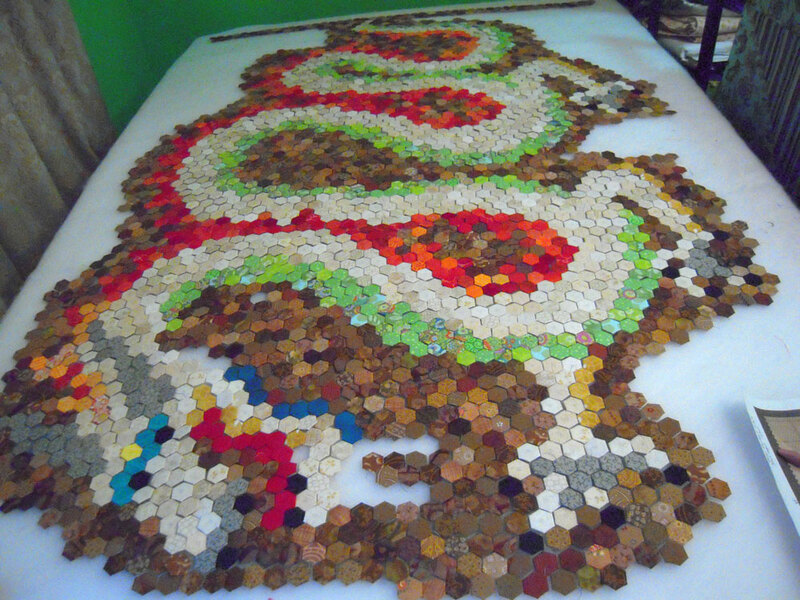 The piecing was done fairly quickly a few months back when we were packing and getting ready to move. I used fabrics that weren’t packed away yet, and this is the improv I came up with. 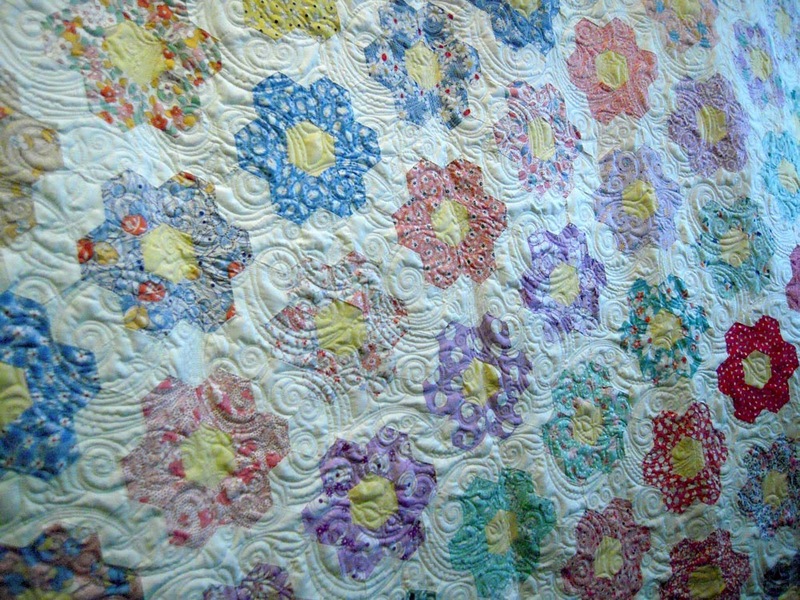 I particularly love the quilting on this, I just made a flower and echoed it adding more flowers here and there. 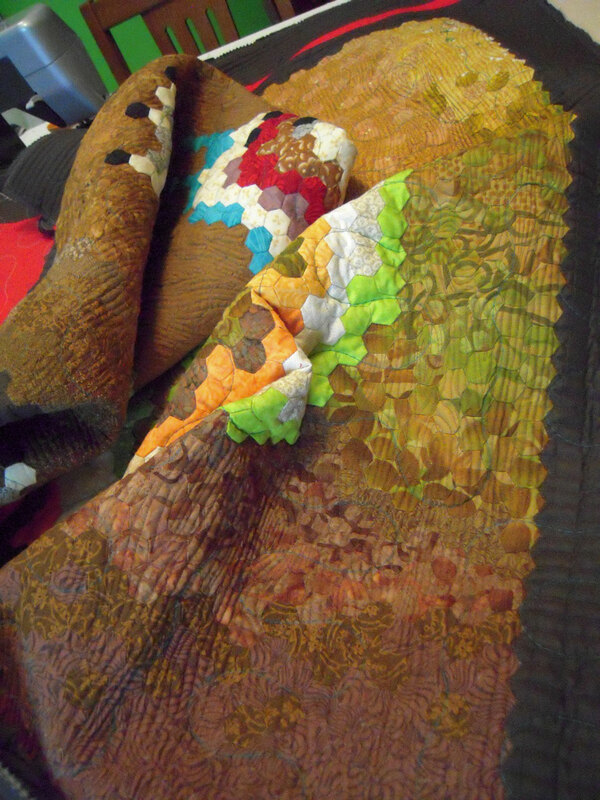 I used some super nice fabric for the back that my friend Rachel gave me a while back ~ it’s so soft and luxurious… makes the quilt super special. In fact, Rachel has been an inspiration to me ever since I started going to PMQG meetings. 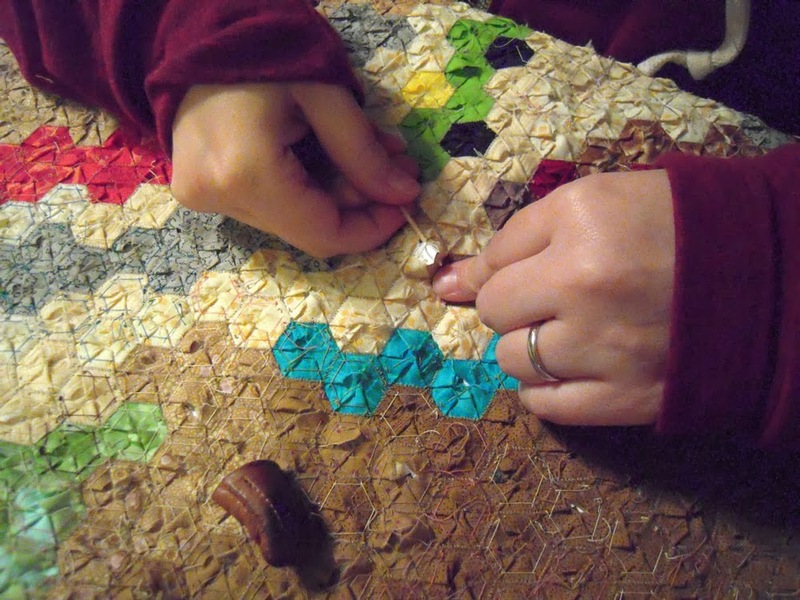 She has been there every time I needed help with quilting… and even in some social settings. 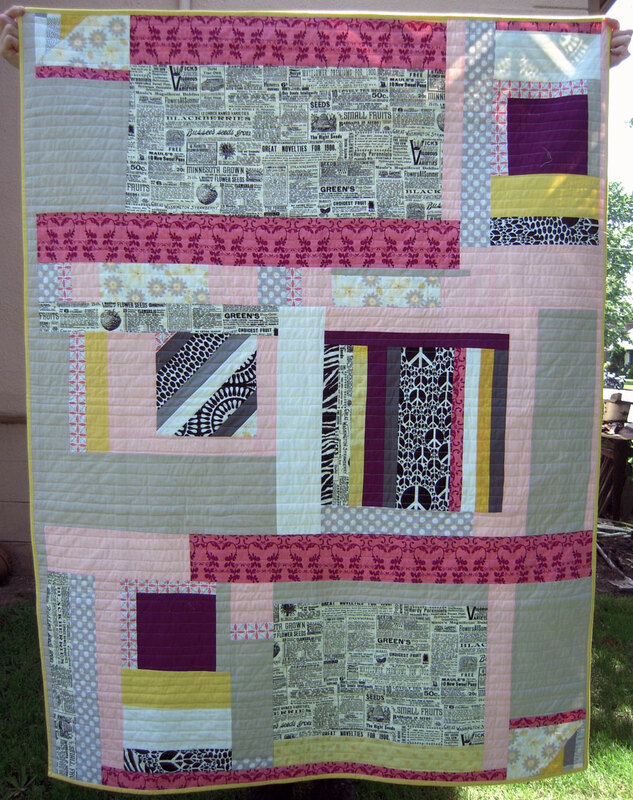 She recently wrote a bit for “Quilting Happiness” that wasn’t included in the book, but is published here. 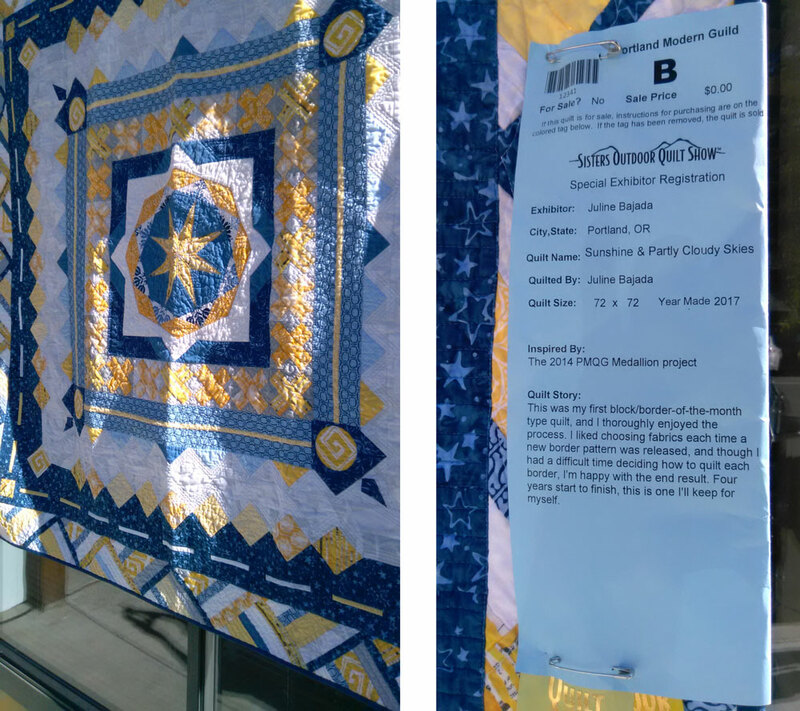 It was such an inspirational piece about volunteering in a women’s correctional facility, the difficulties these women face, and how quilting helped her bridge a major communication gap with them. I highly recommend reading it. Now I understand why she has always had such patience with me, she’s had practice!! 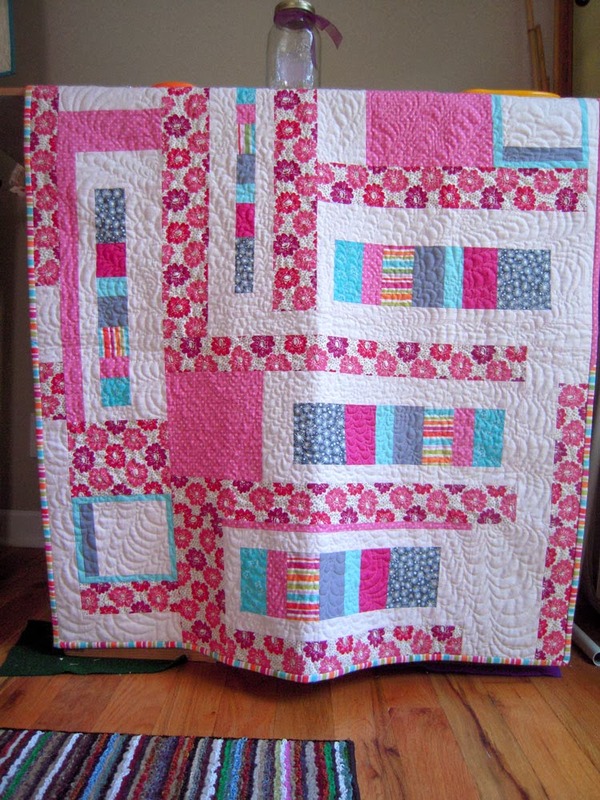 I want to donate my new little quilt! 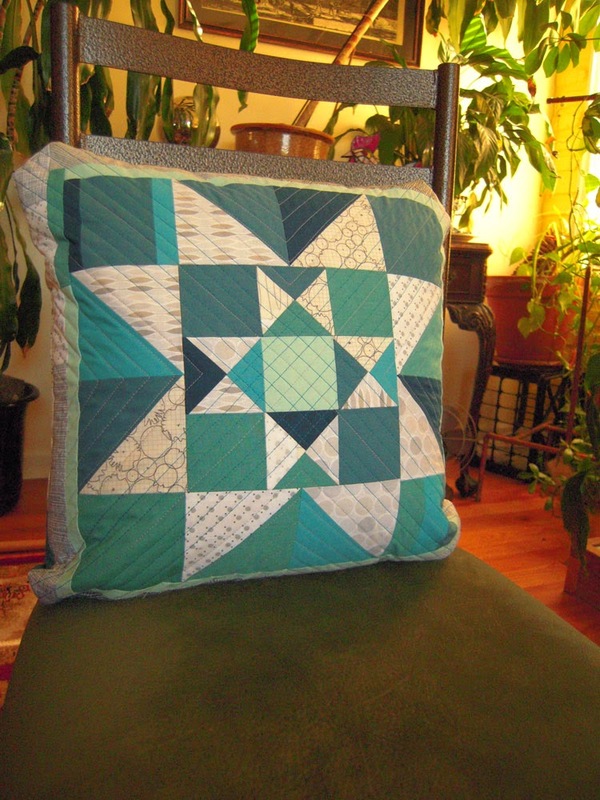 It will be a first for me… I usually make quilts as gifts for friends and family, or just for myself. I’ve never made one to give away to a charity before. 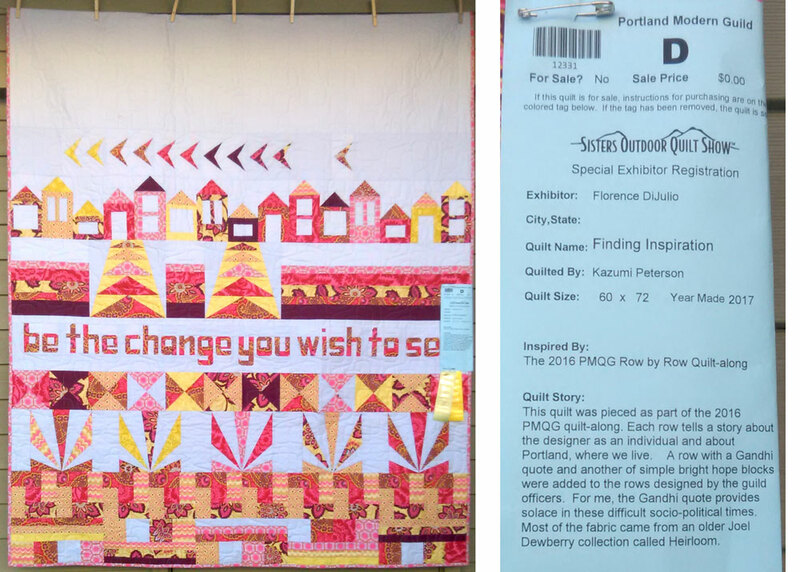 (I know, I know… I should have been donating quilts already) Anyway, I want to give it to a family shelter because I was given a quilt many years ago when I was pregnant and staying in a shelter, and it really meant a lot to me… and to my daughter. There are some holes, and the binding is worn completely through, it’s only string tied… but I’ve loved this quilt, and still do. I hope the one I made will be just as loved by someone who needs it as much as I did! 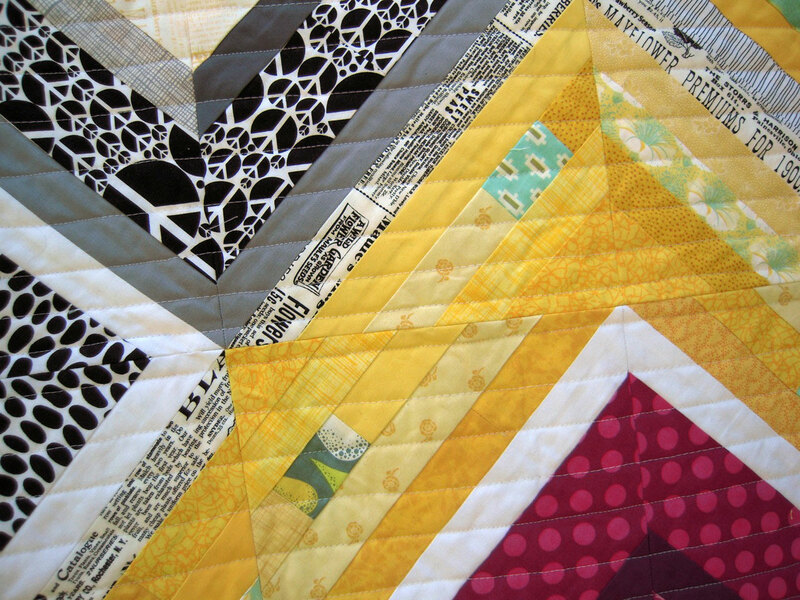 As Rachel always says: Quilters Rock! There is just so much to write about. I guess that’s what happens when you don’t blog for as long as I have. 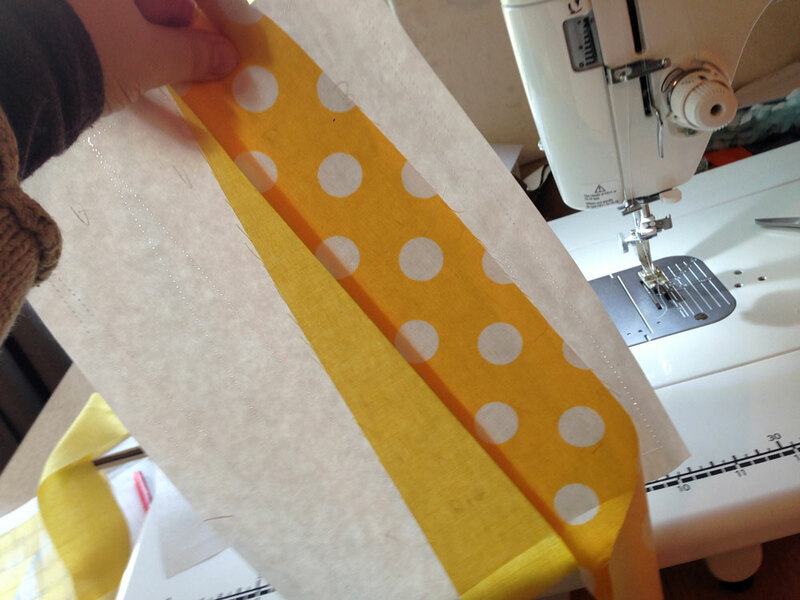 We are now in our new home, working from our new studio (we print t-shirts), and I even have a new sewing space! Everything is still in boxes, so no great ‘new house’ photos today. 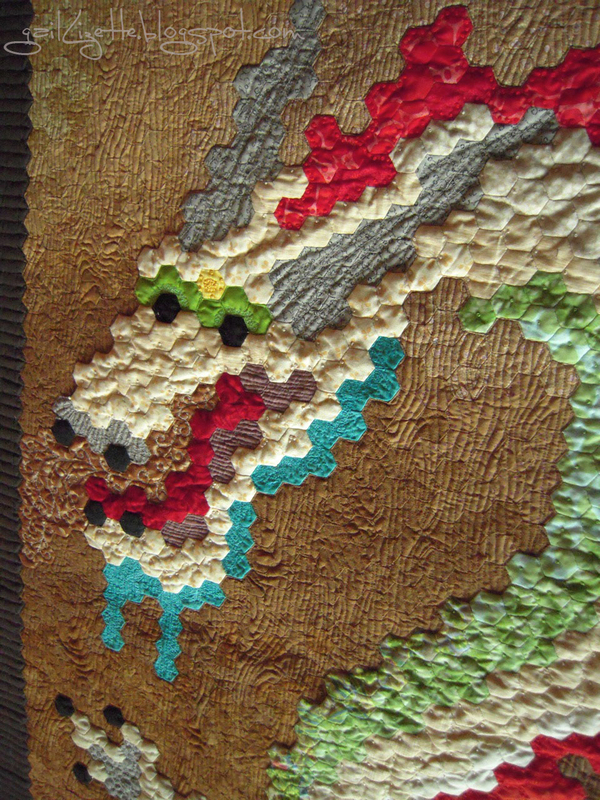 Instead I wanted to tell you that my Wood Dragon Hexie Quilt was accepted into the NW Quilting Expo which is happening next weekend 9/19 – 9/21 at the Expo Center here in Portland. I’m so excited… and a bit nervous. It’s really hard to let go of that quilt. It felt like leaving my daughter at the airport to go to Europe by herself… but at some point you just have to do it and move on. I’m super excited to share this quilt with others. 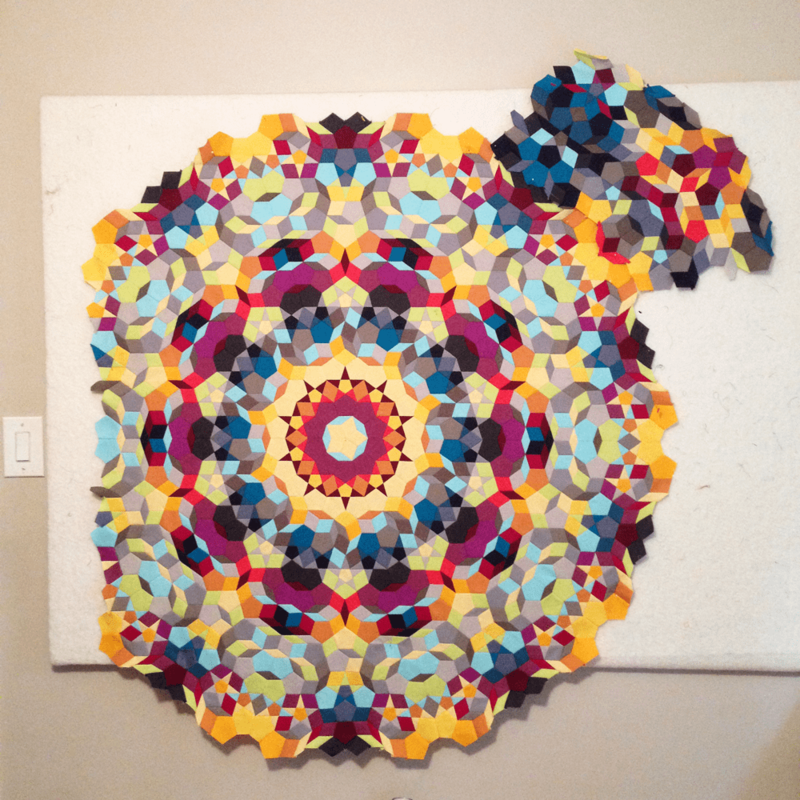 It’s the best part about making a quilt… especially one that took 18 months to complete!! I am getting the quilt judged at the show. 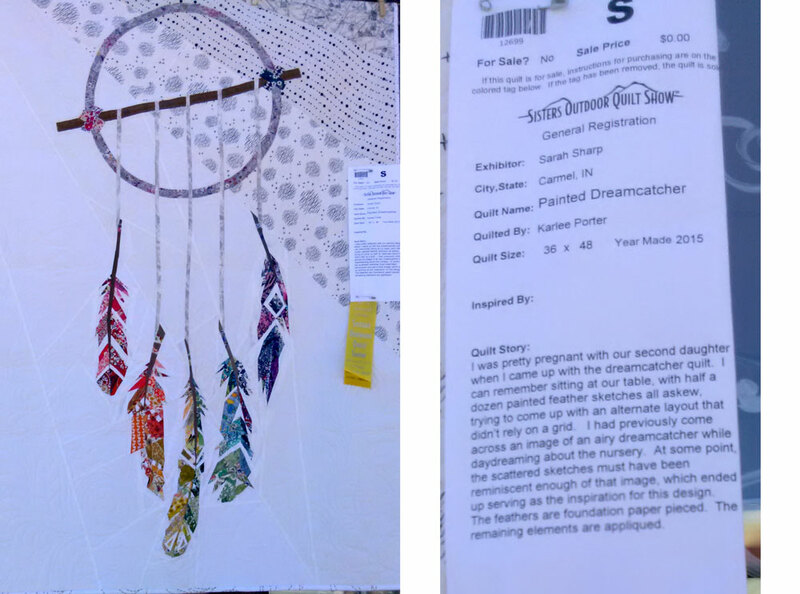 I had the squid quilt judged there last year and their comments were very helpful. I’m always interested in critiques by people “in the know”. 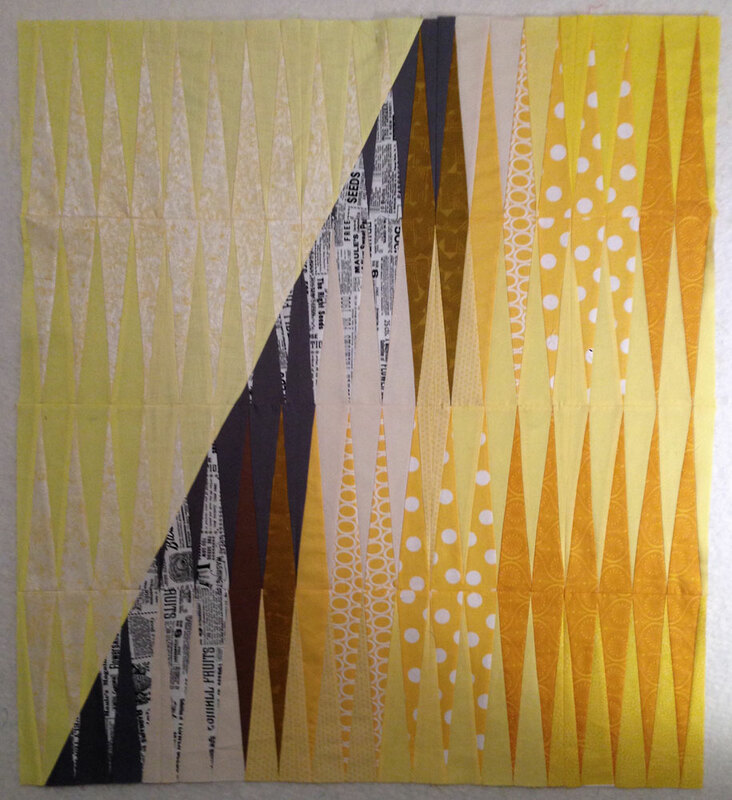 Seems there is a lot of judgement on quilts these days based only on design. 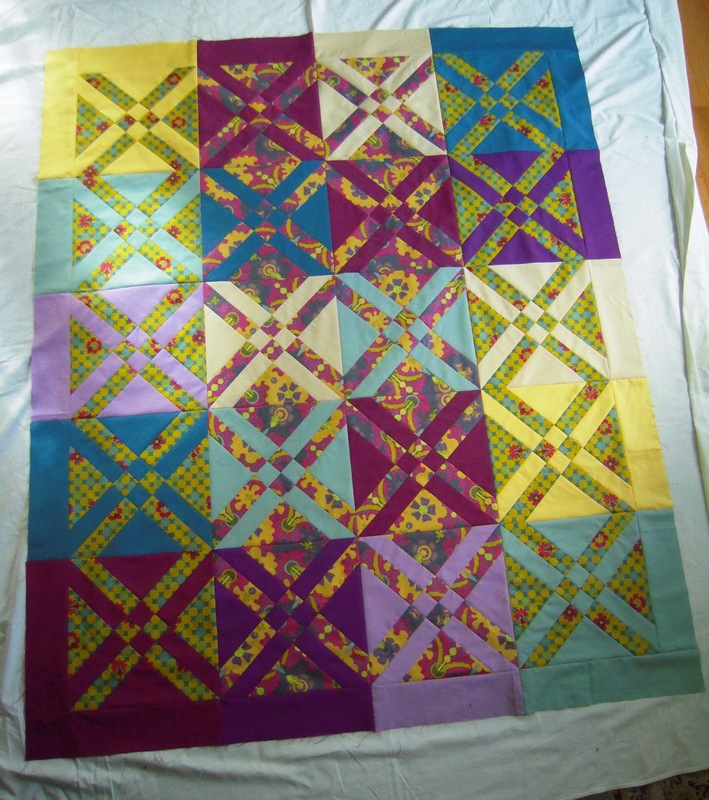 I thrive on learning more about the actual construction of the quilt and how to make it better, than on the design. 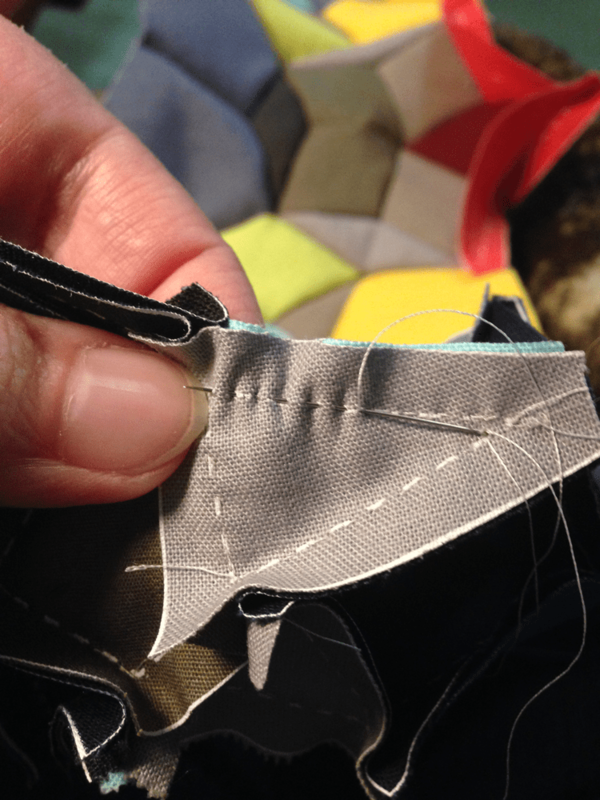 But that’s just me, and honestly, the design part comes naturally to me… it’s the actual stitching, piecing, and quilting that I stumble over and want to get better at. 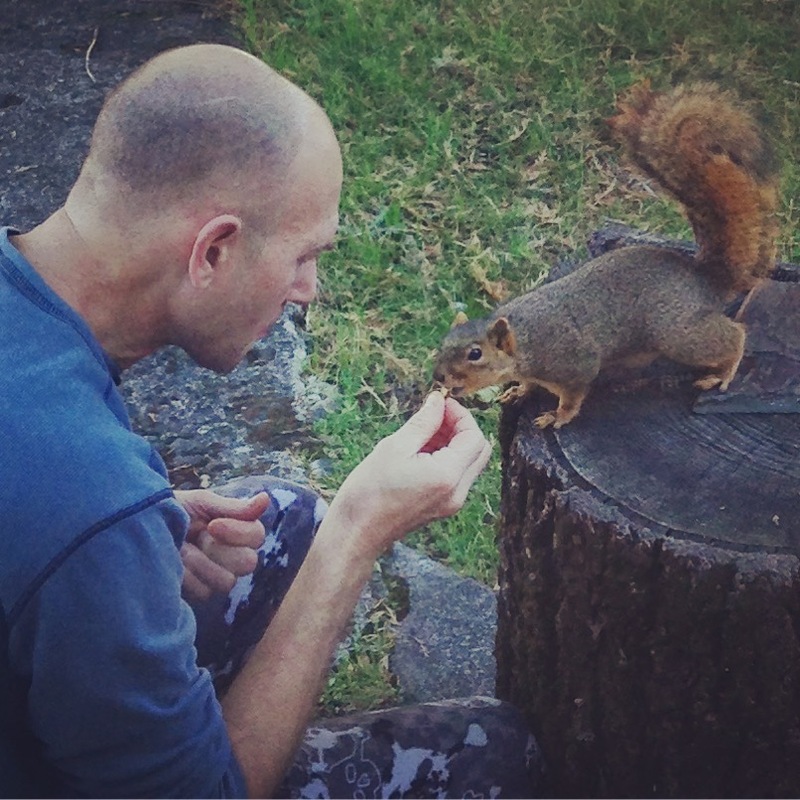 Hope to see you at the show… and I promise new pictures next post! 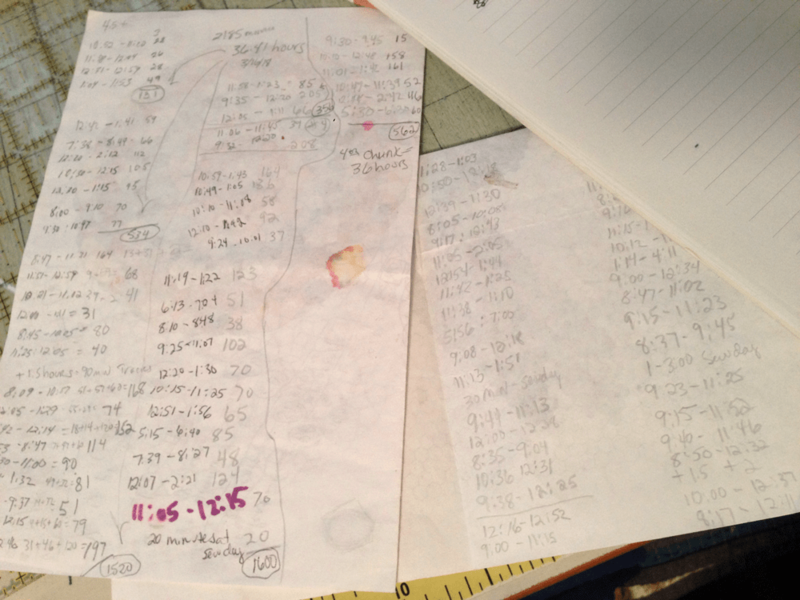 Lots of 1/2″ hexies… and notes to keep it all straight! Getting the layout right took over a month in itself!! 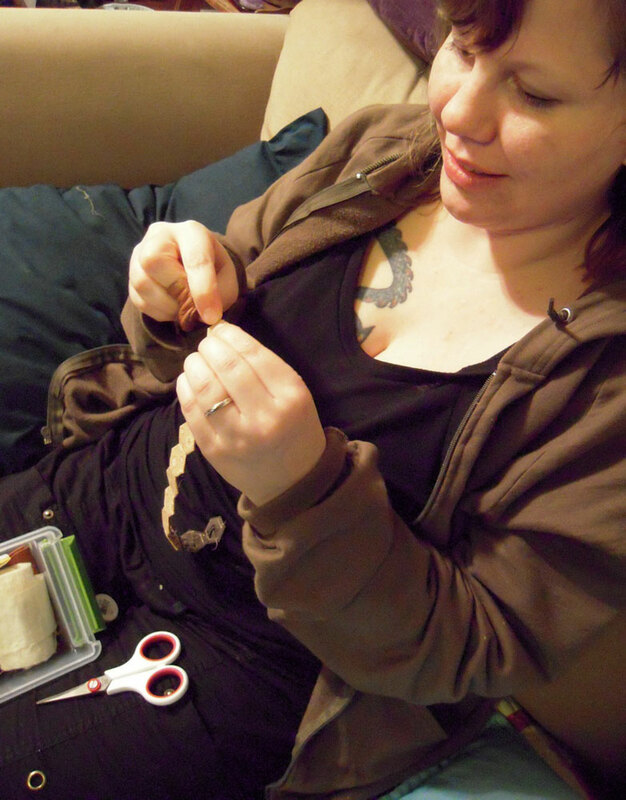 This is how I looked for about a year… my hexies were always a reach away. 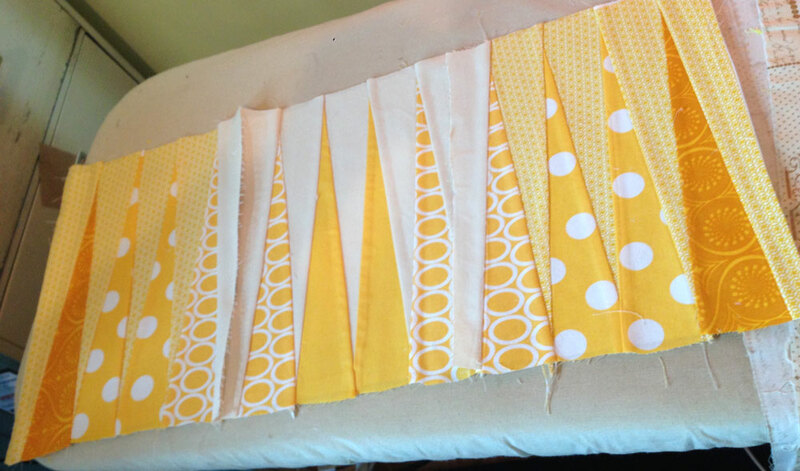 My daughters’ long pillow worked great as a form to roll the growing quilt onto as I stitched. 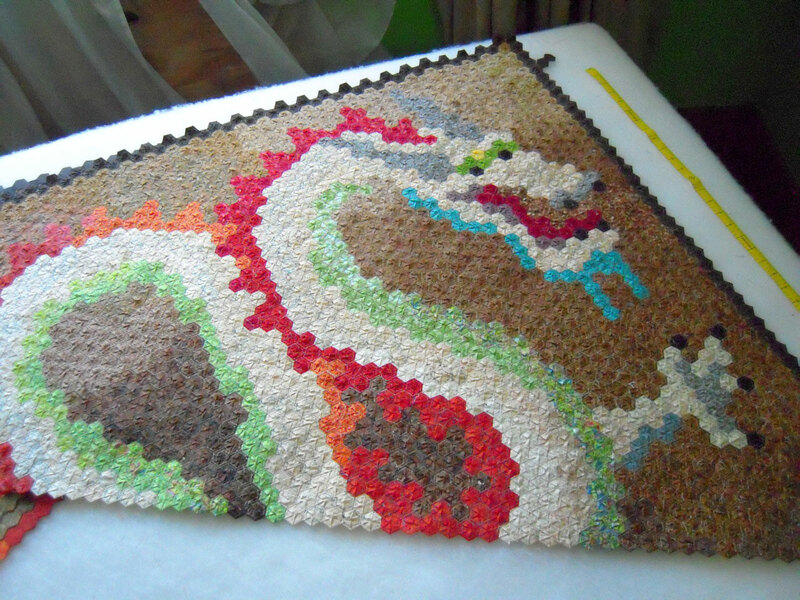 Back of the dragon… my hexies completely covered the paper hexies making the whole quilt a little thicker. 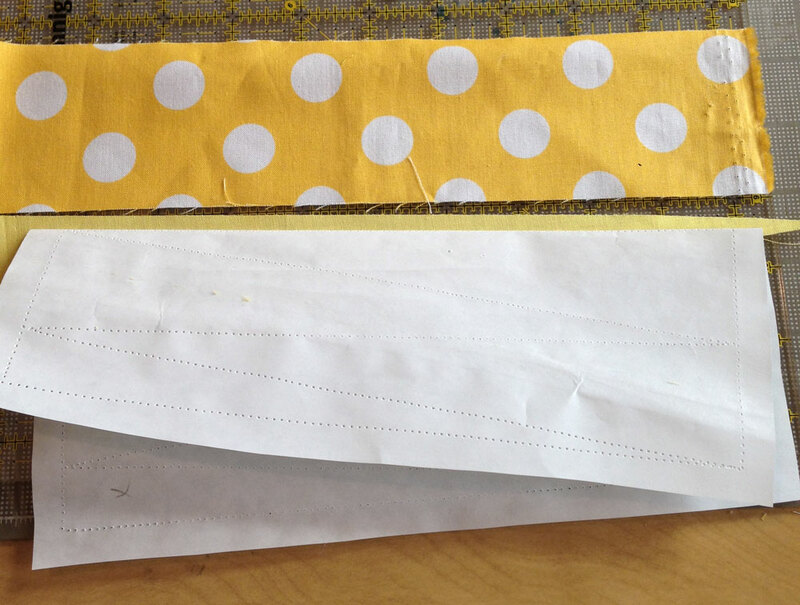 Picking the papers out… good thing I punched holes in them before sewing – a toothpick made the work quick! Super proud of my woodgrain free motion quilting pattern. 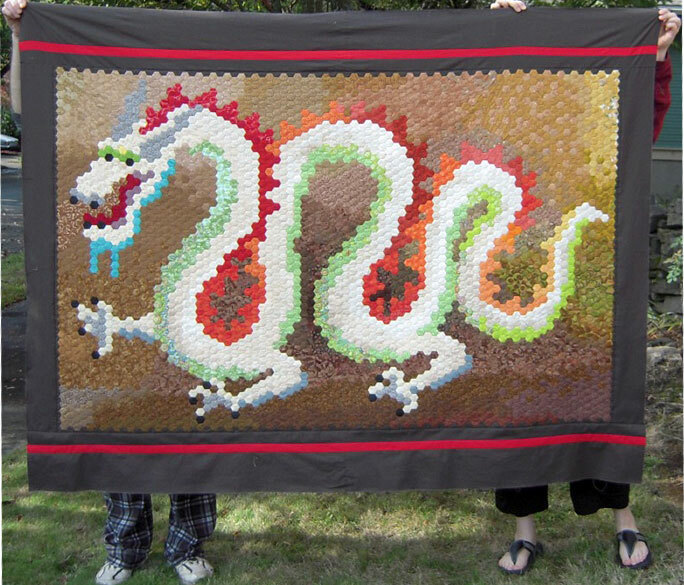 How to quilt the dragon?? 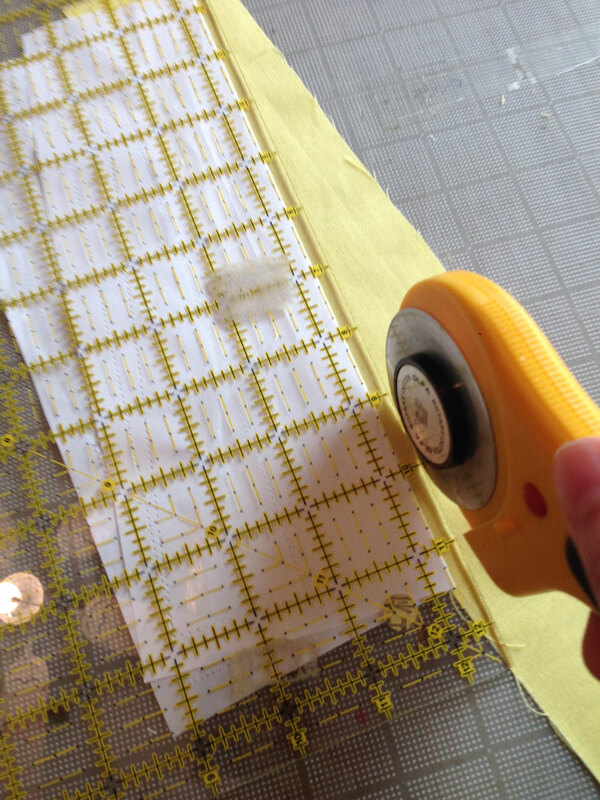 French knots to the rescue!